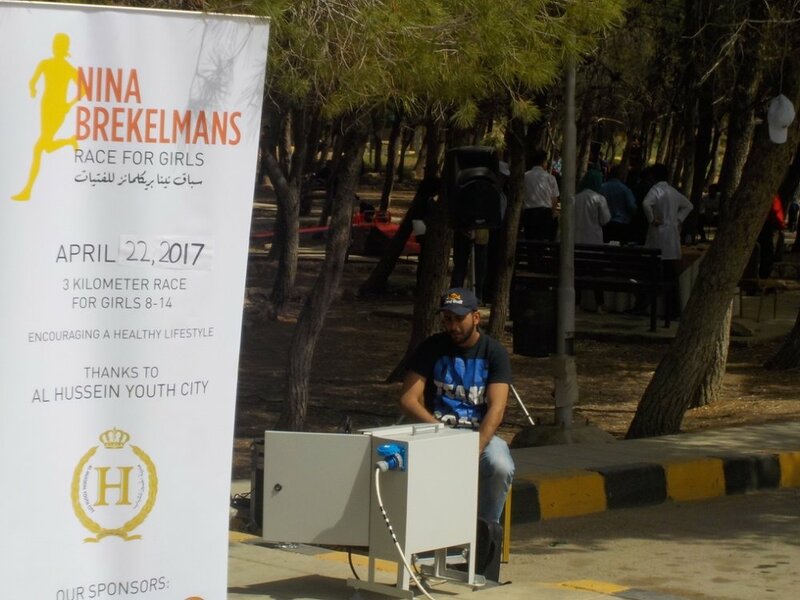 Lilly Frost is part of the Fulbright leadership team for 2017 Nina Brekelmans Running Camp and Race for Girls. 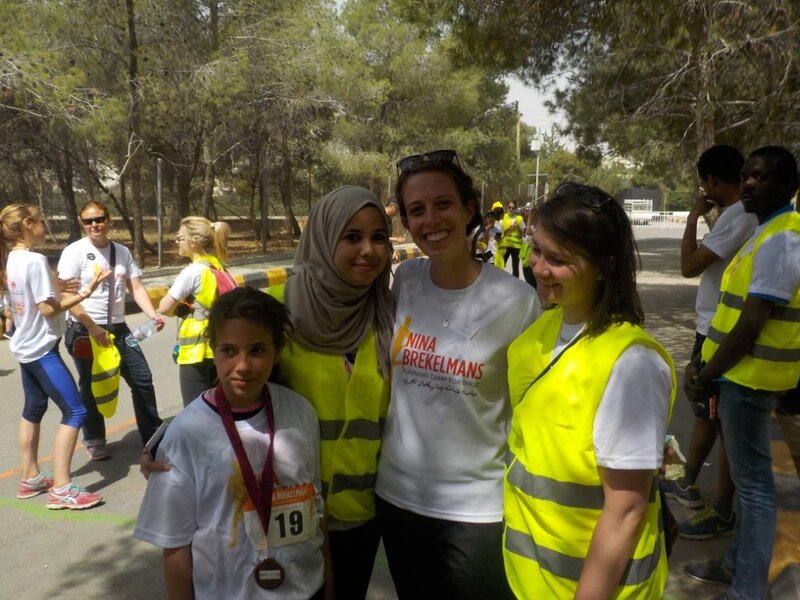 Lilly has spent the past year in Jordan conducting research for her PhD dissertation. 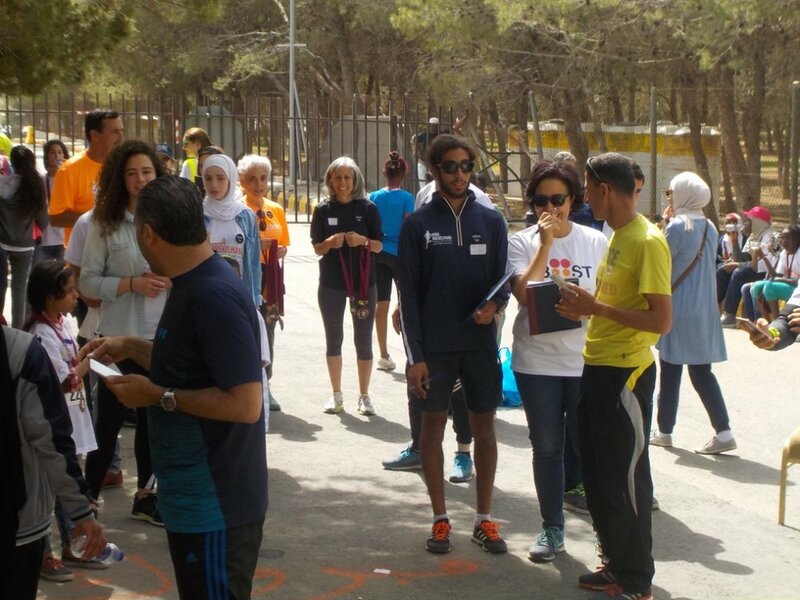 Our race day—the exciting culmination of our four-week running camp—kicked off with about fifty local and expat volunteers gearing up for the day. 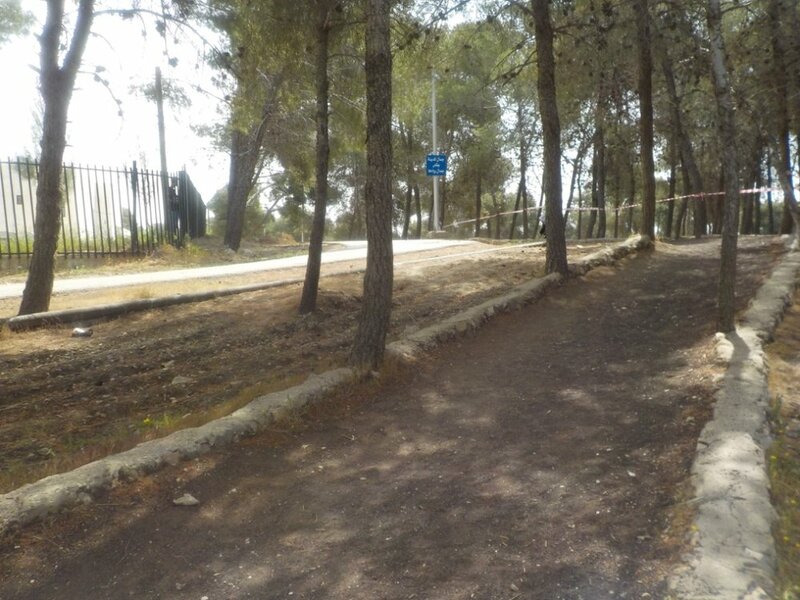 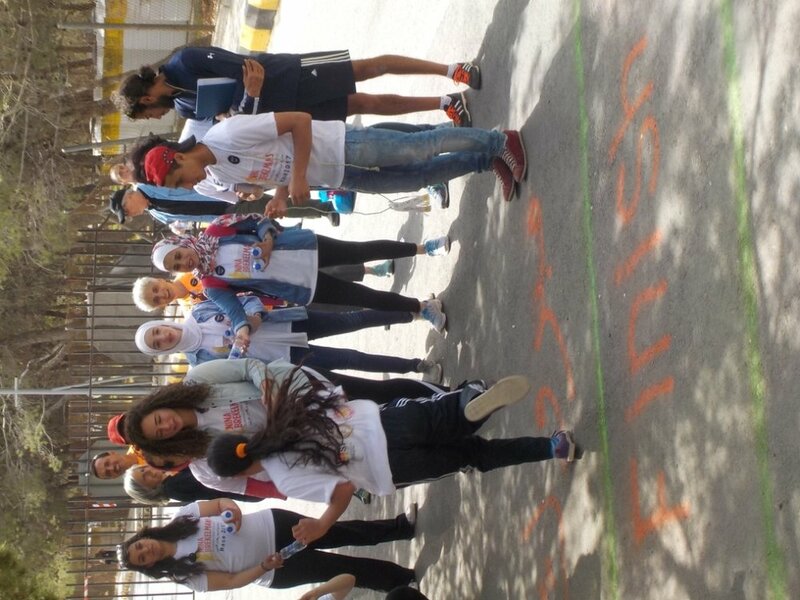 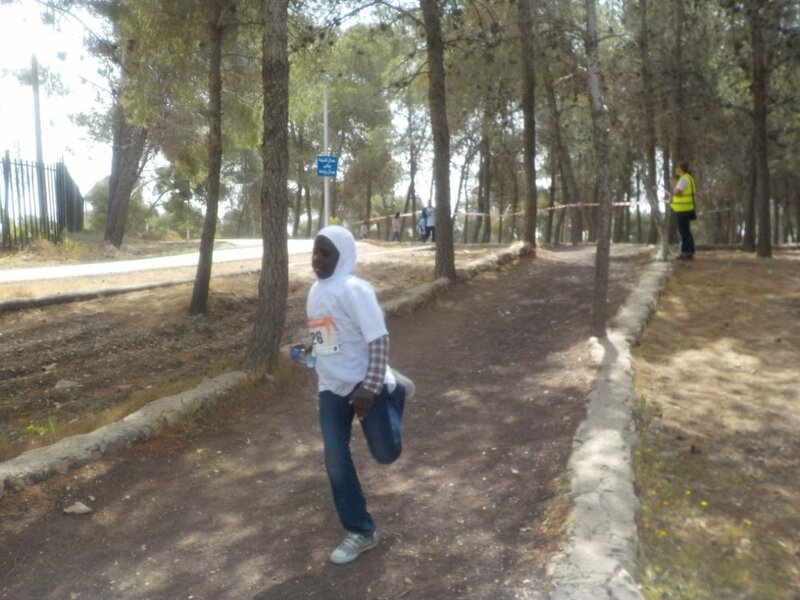 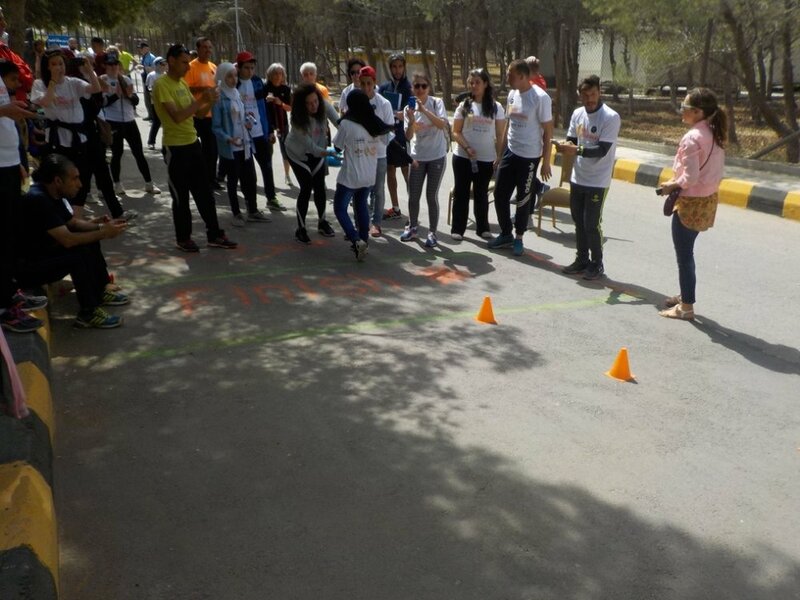 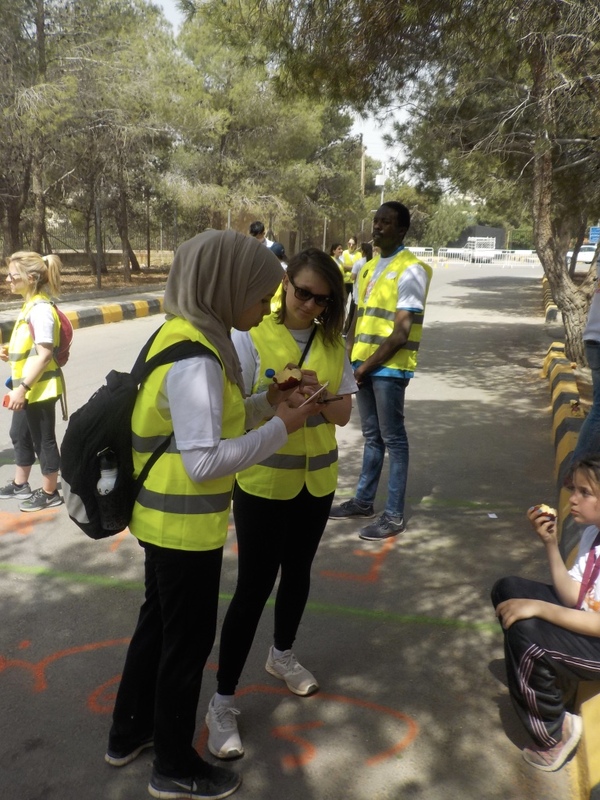 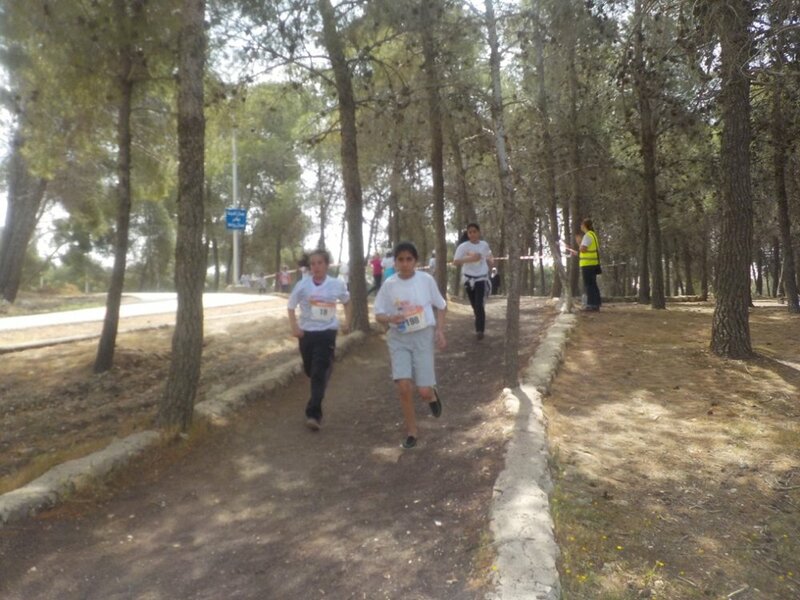 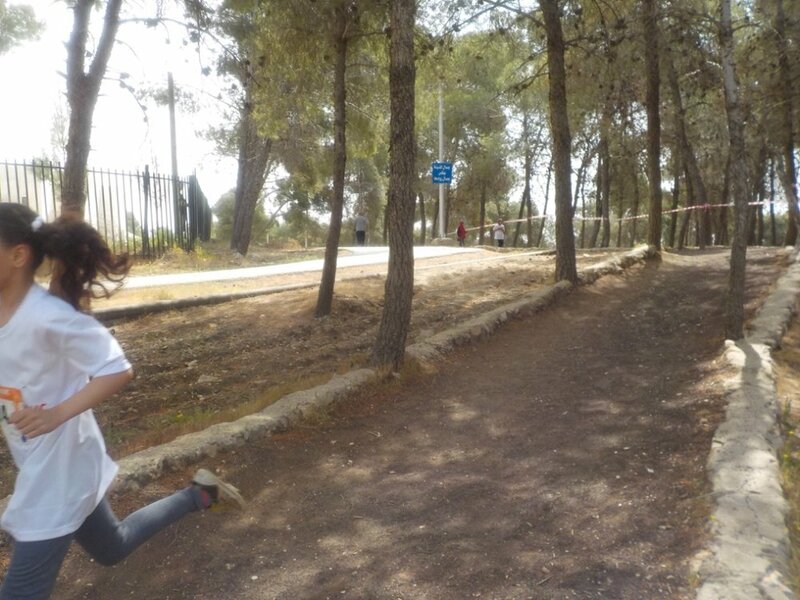 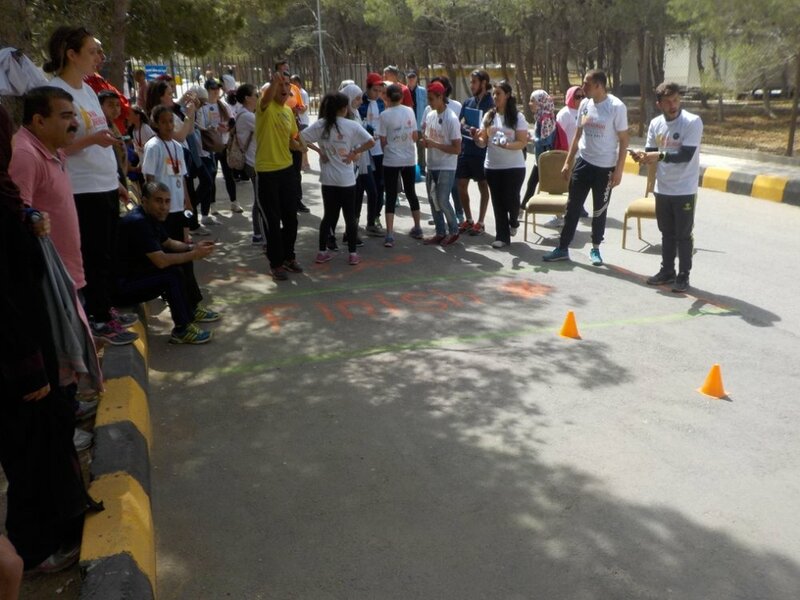 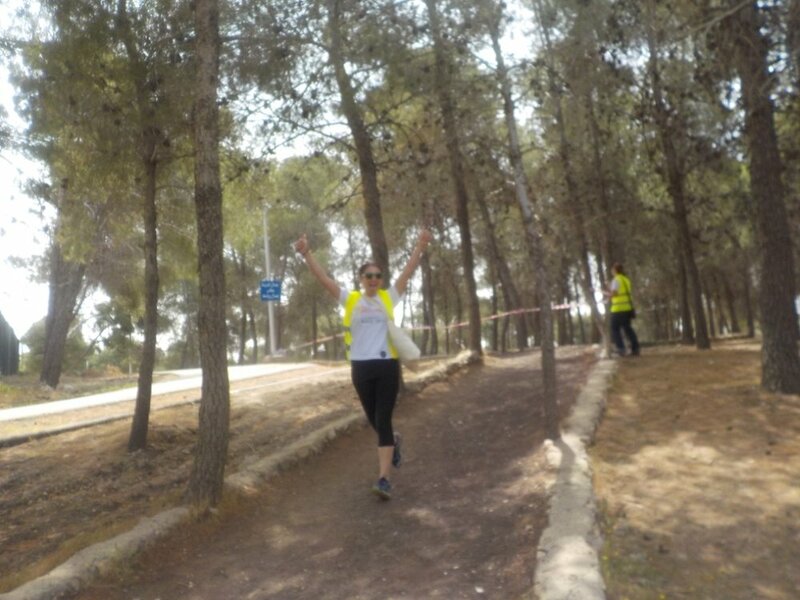 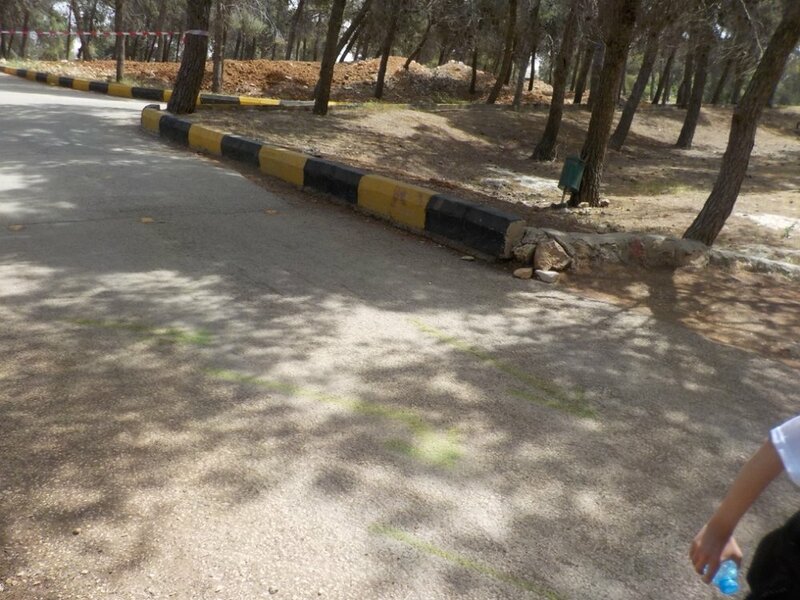 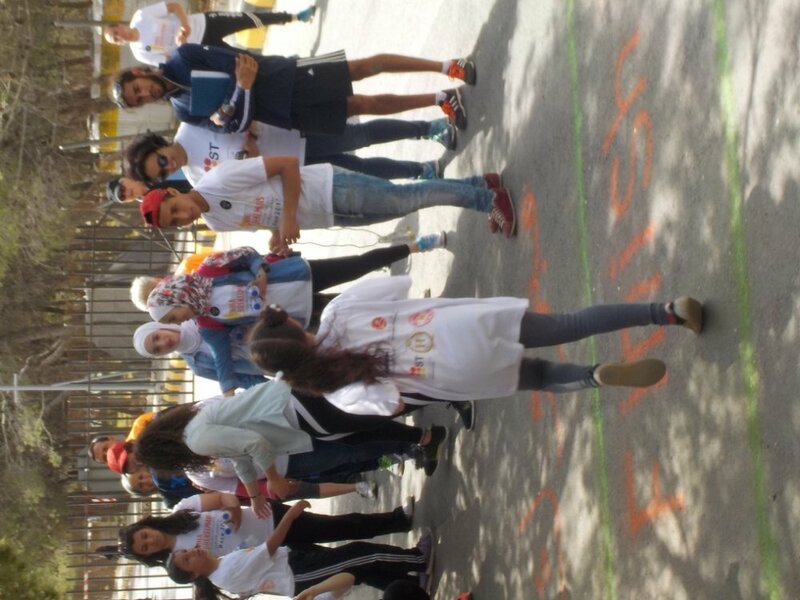 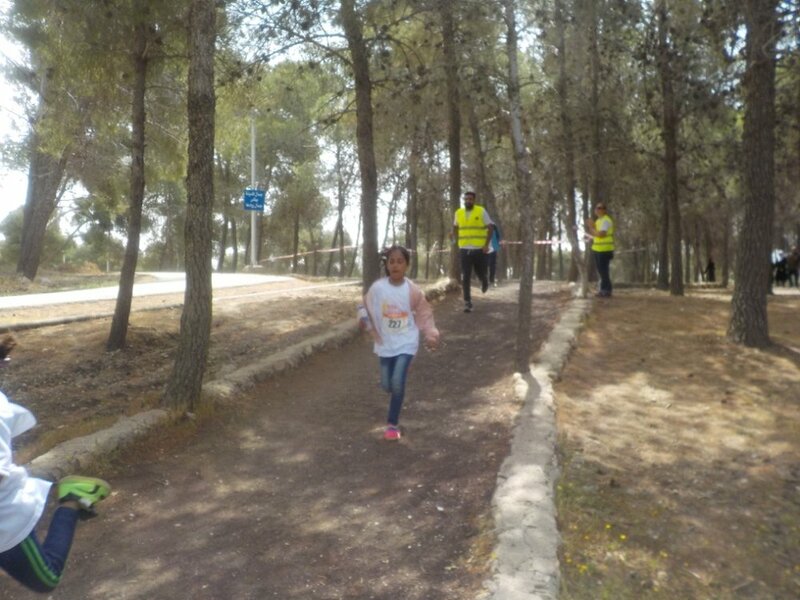 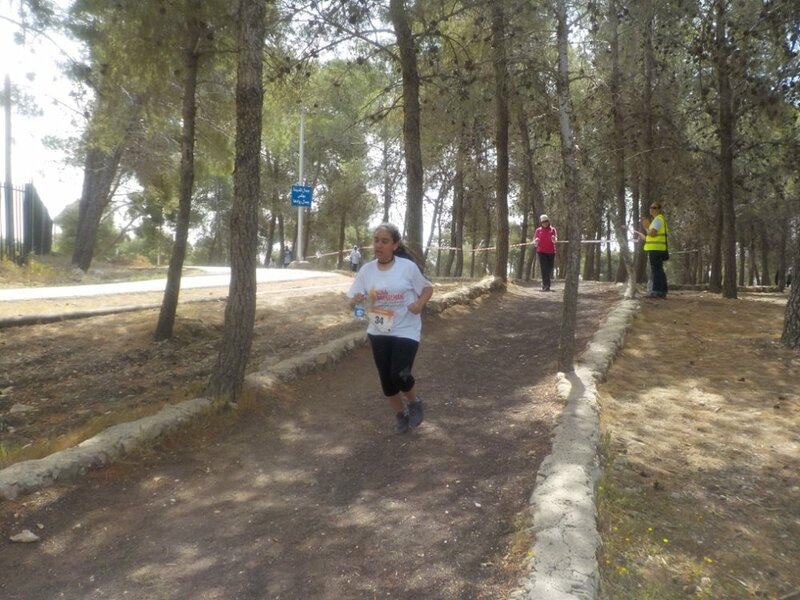 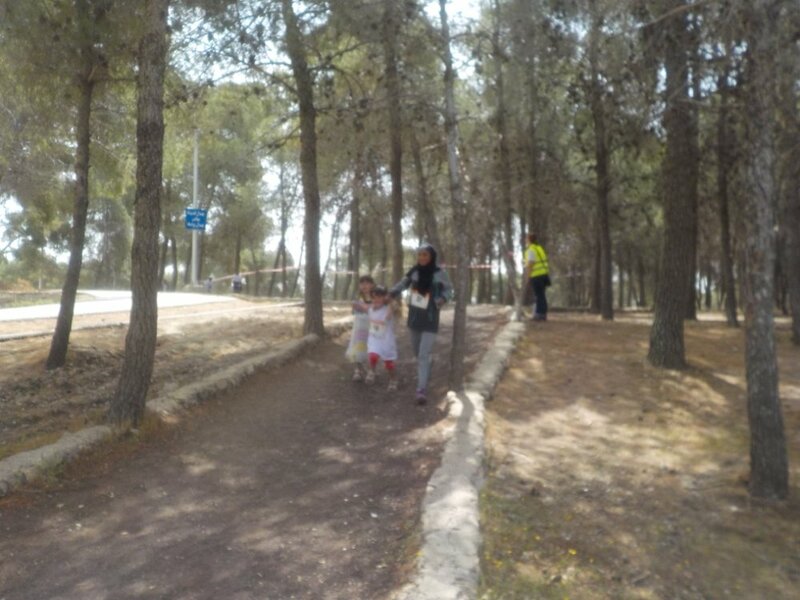 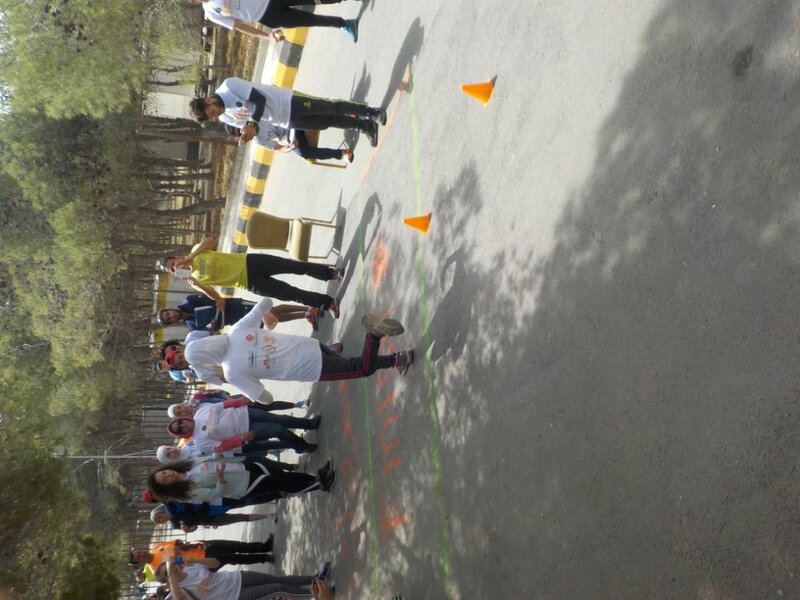 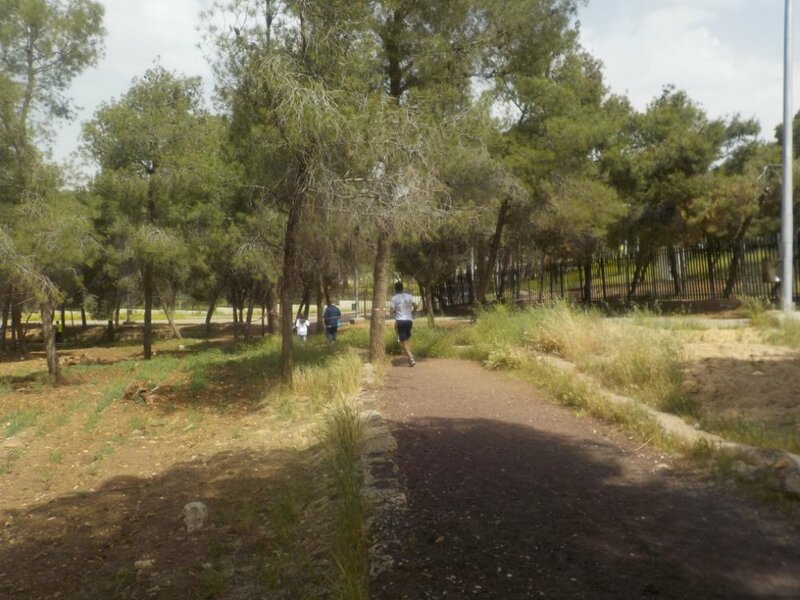 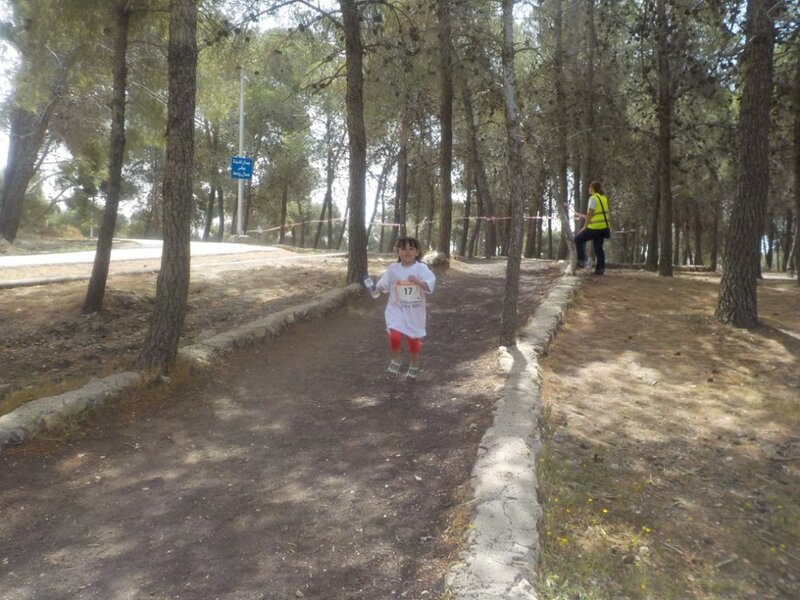 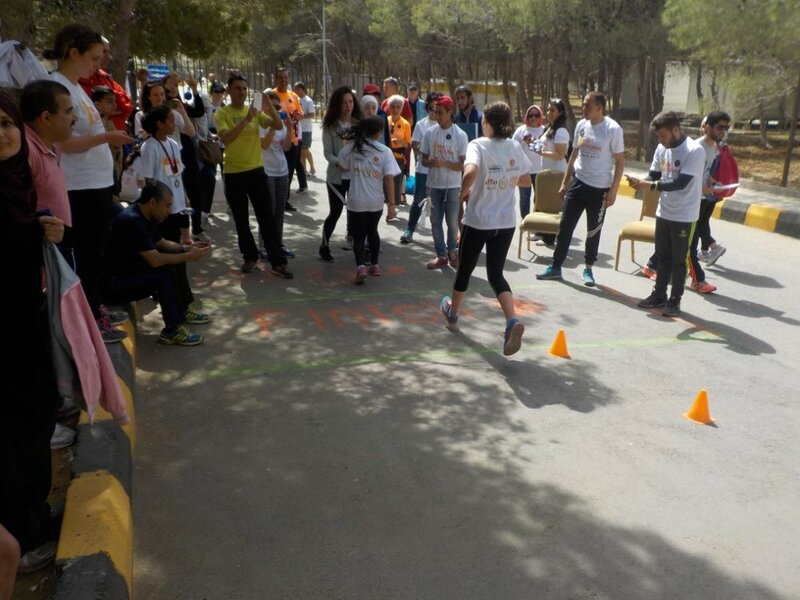 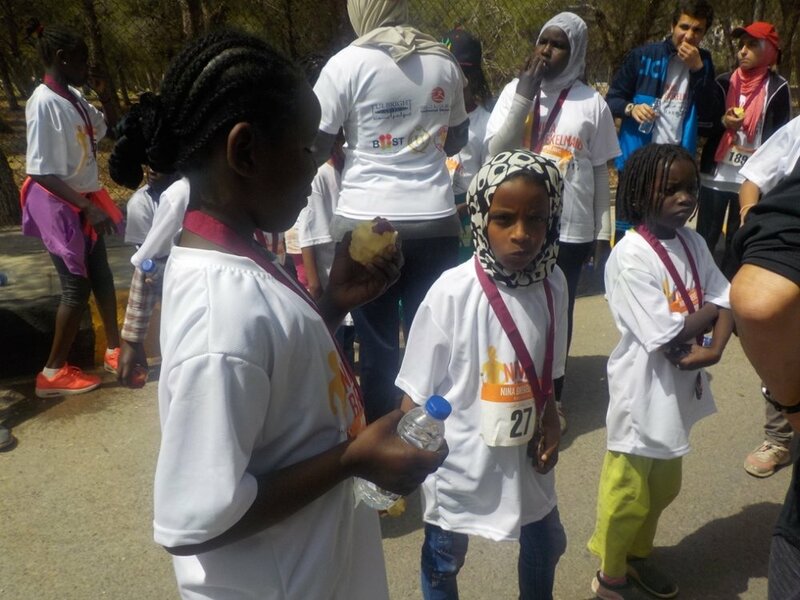 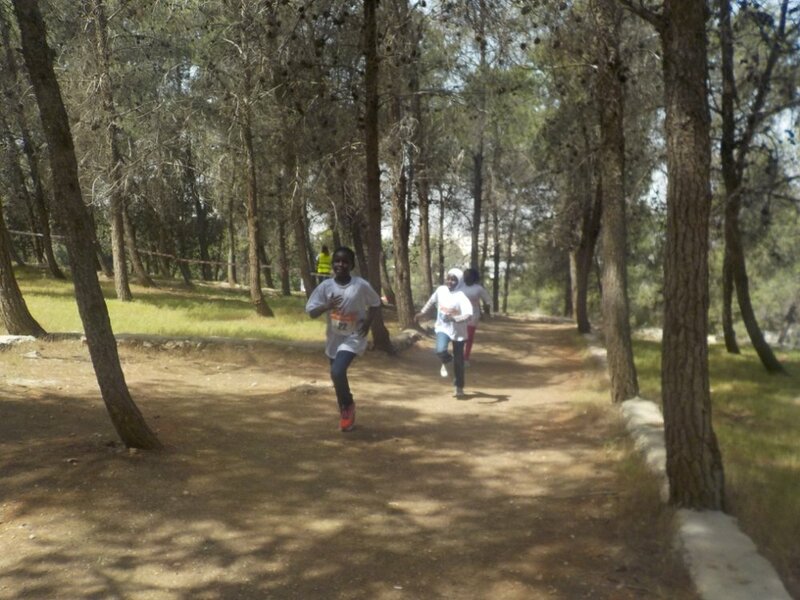 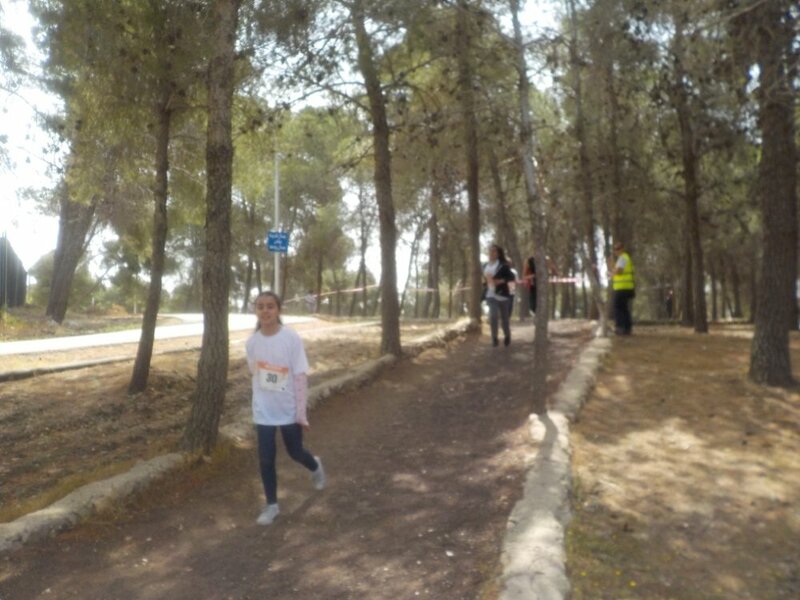 After collecting their race-day t-shirts and some breakfast snacks, the volunteers helped mark and prepare the 3-kilometer race course for the girls. 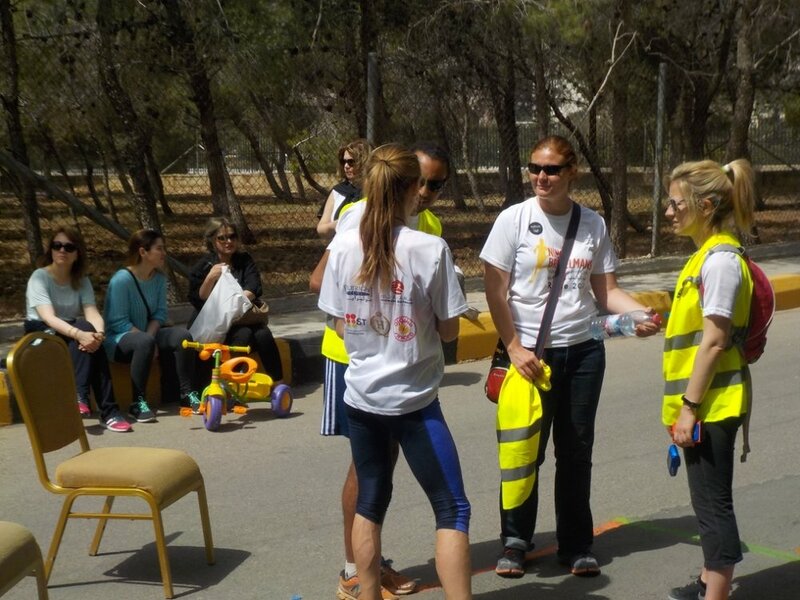 These preparations included a mid-way water station because of the day’s unusually high temperatures (which was a big hit as the girls chugged the water down and dramatically tossed the bottles aside while racing past!). 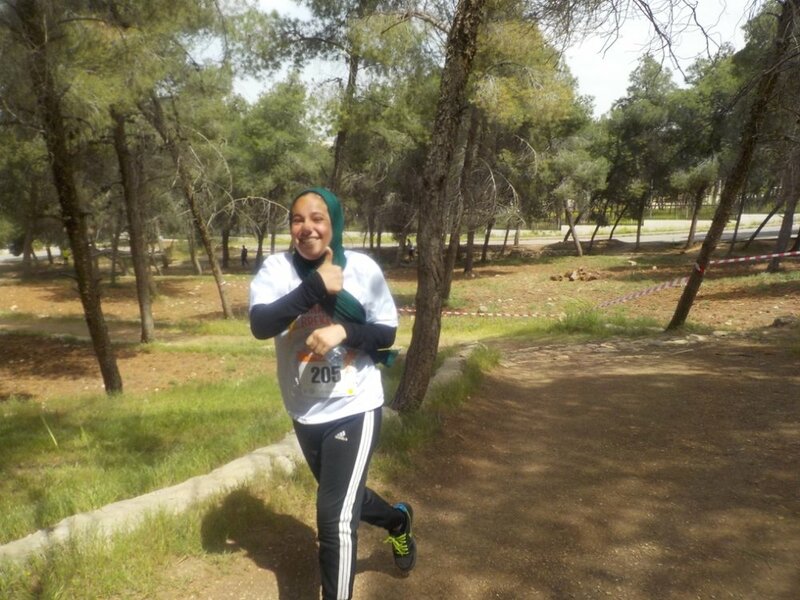 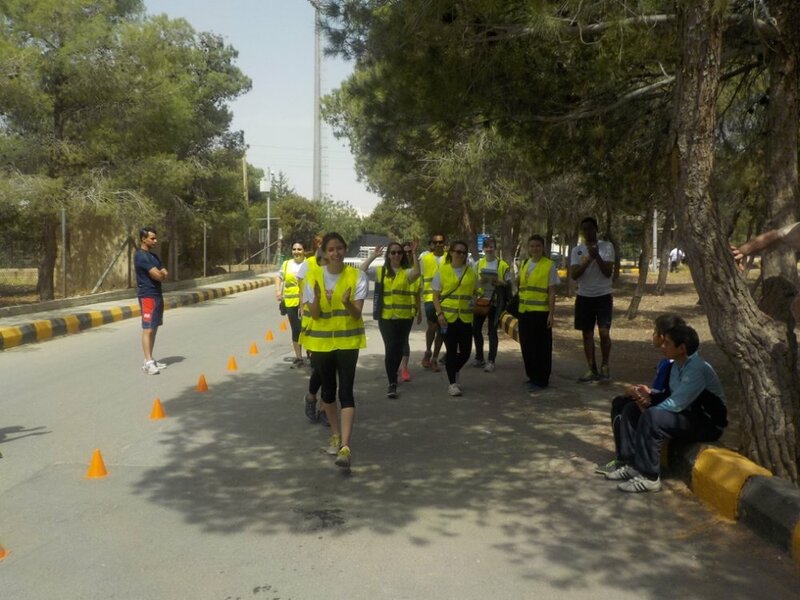 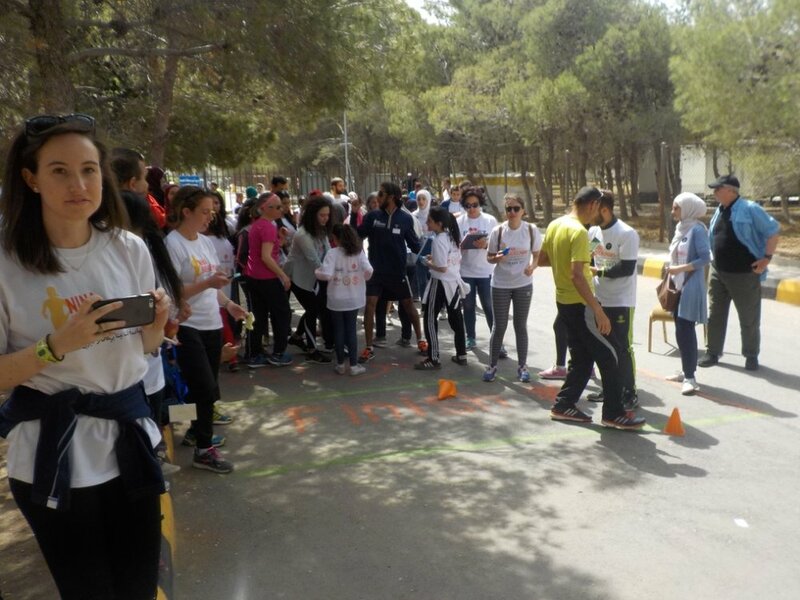 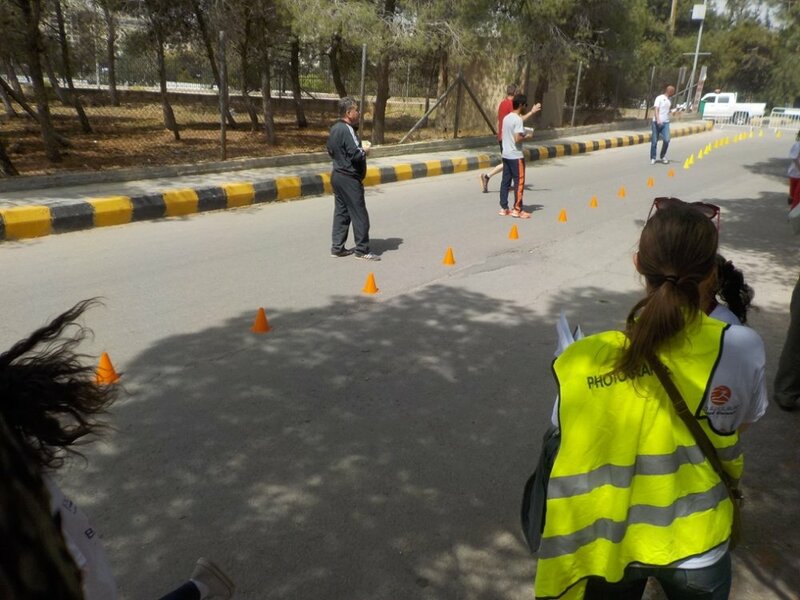 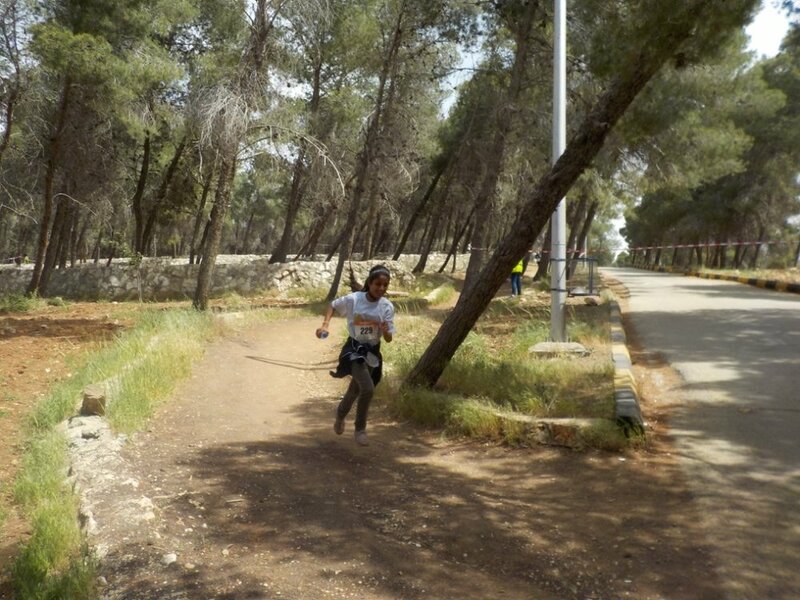 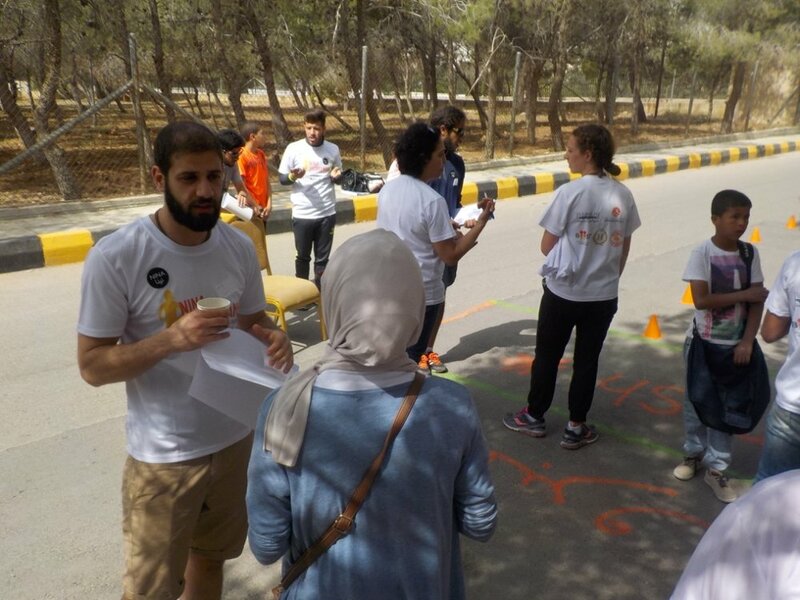 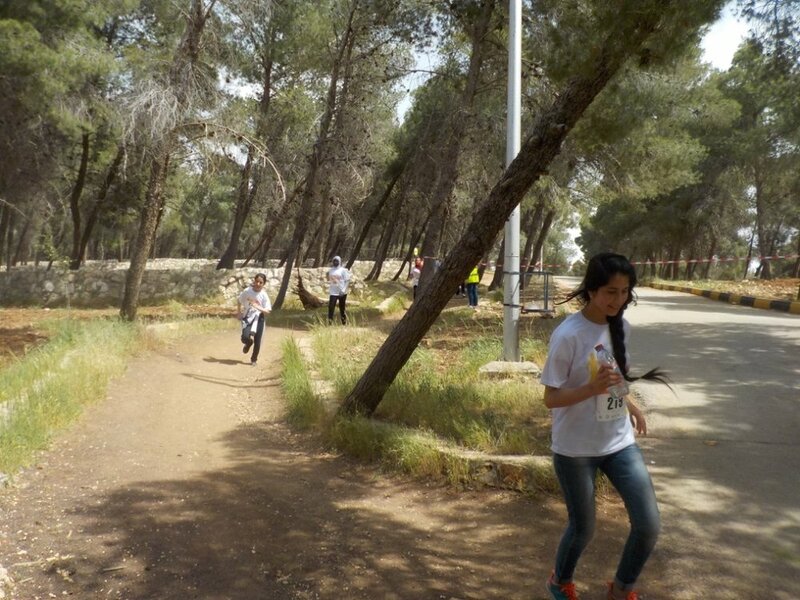 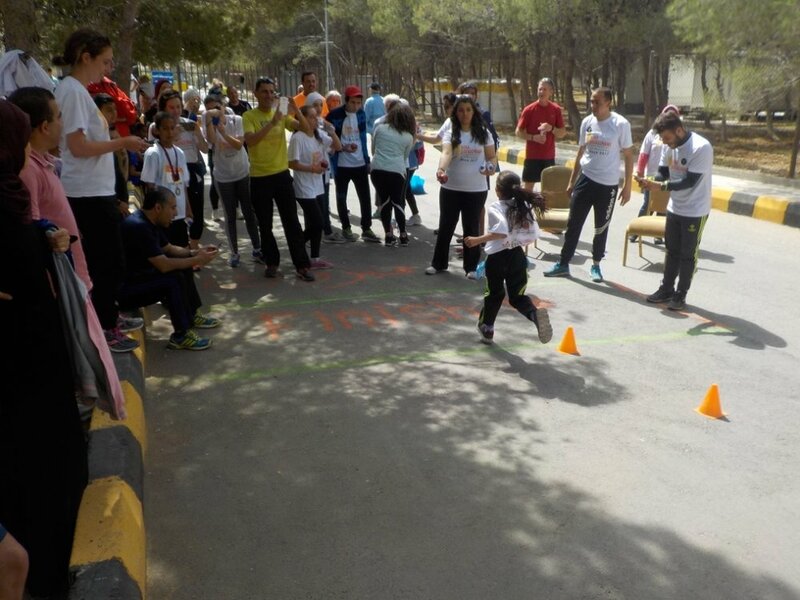 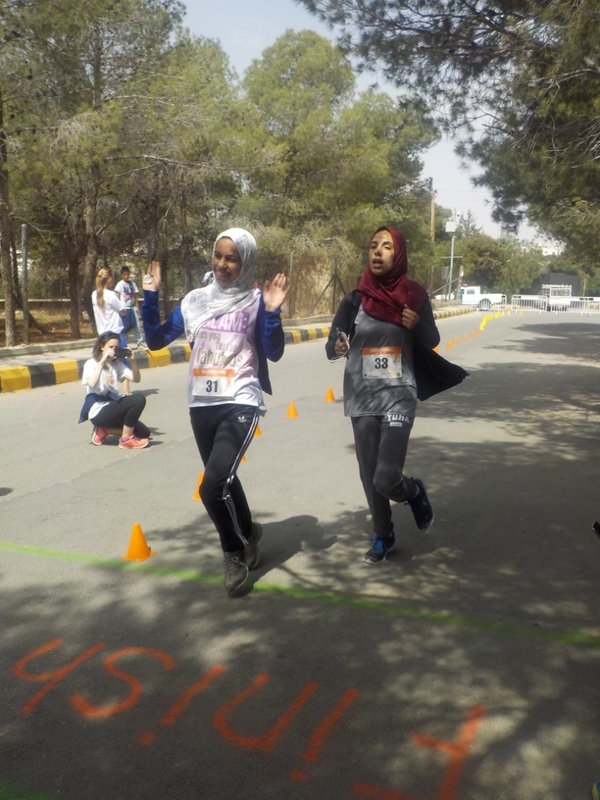 As the course came together, the participants started arriving, including about 20 girls from Irbid, five girls from the Ghor Valley (northern part of the Jordan Valley), and 45 from East and West Amman, many of whom are refugees. 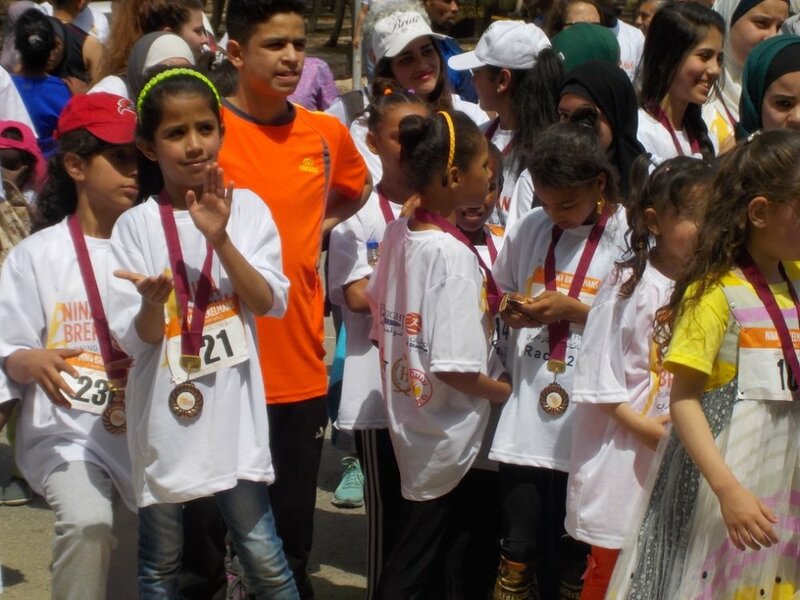 The diverse group of girls warmed up, chatted, and tried on their race-day t-shirts. 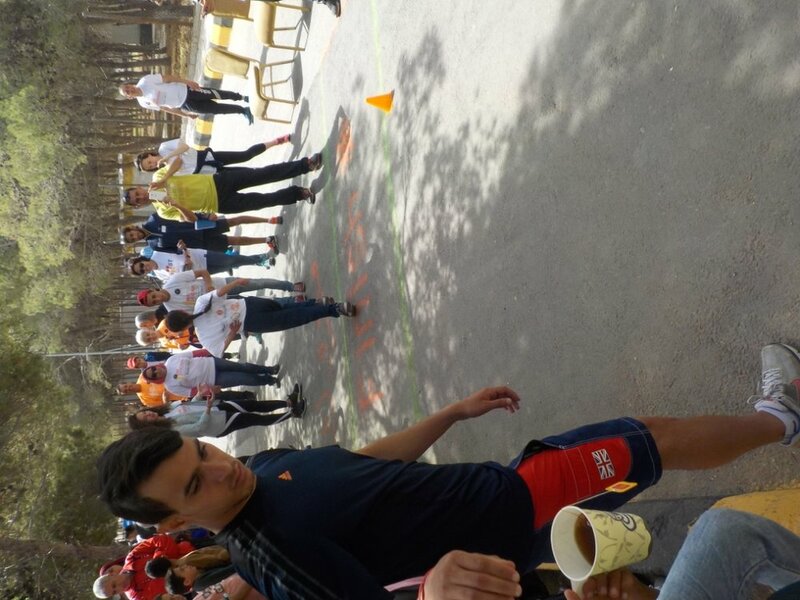 In the background, a DJ provided by Sports City played music and family members bustled about taking pictures and drinking tea. 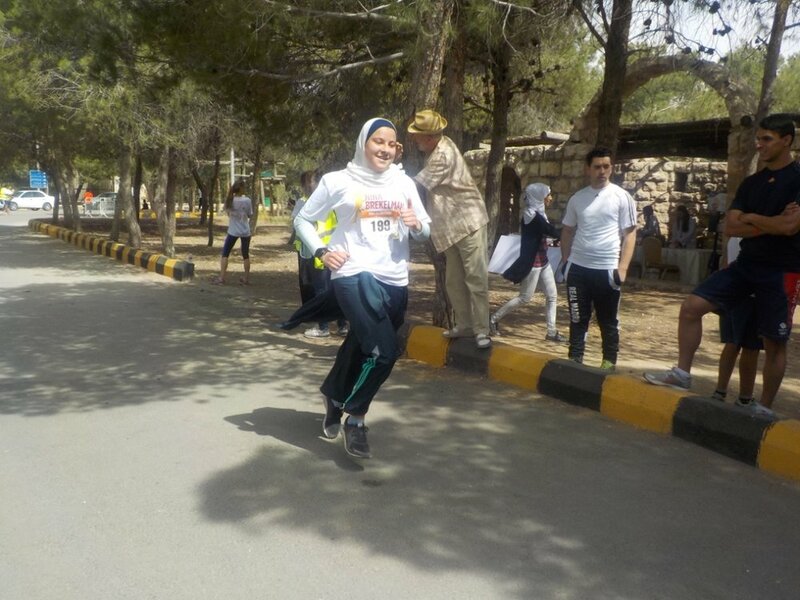 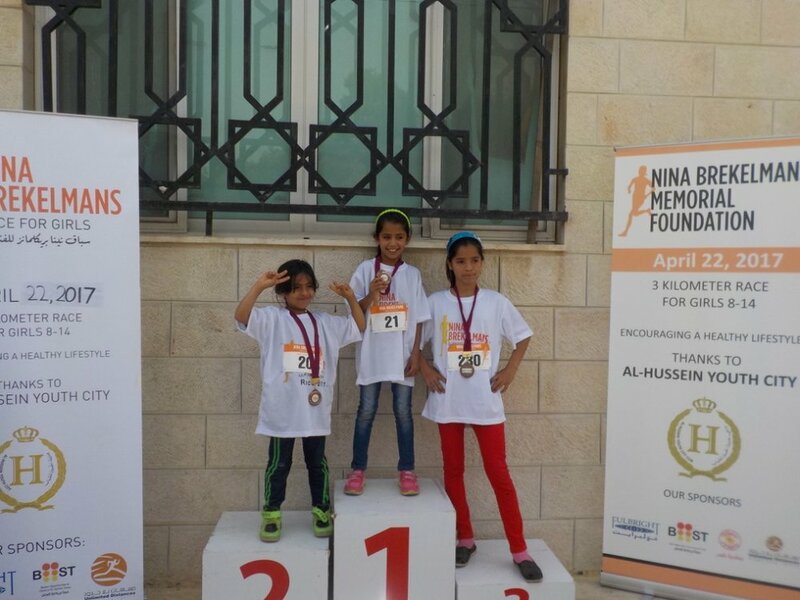 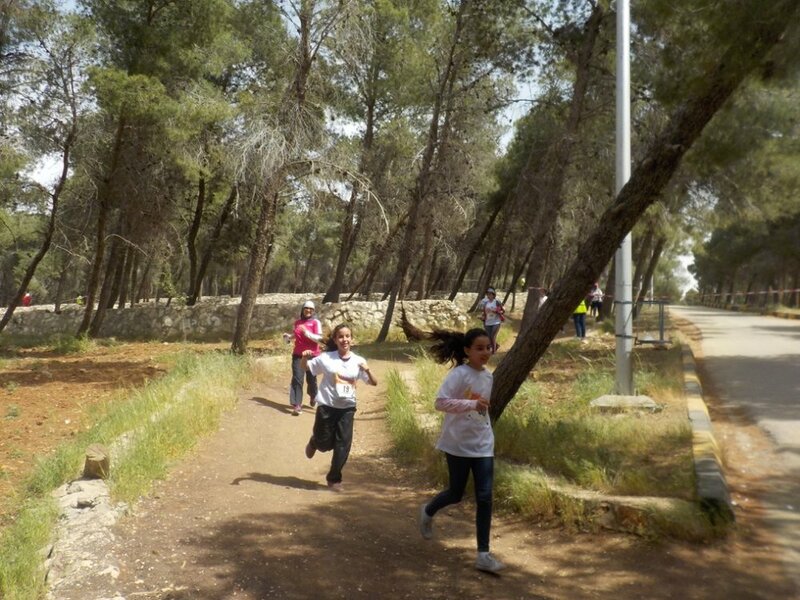 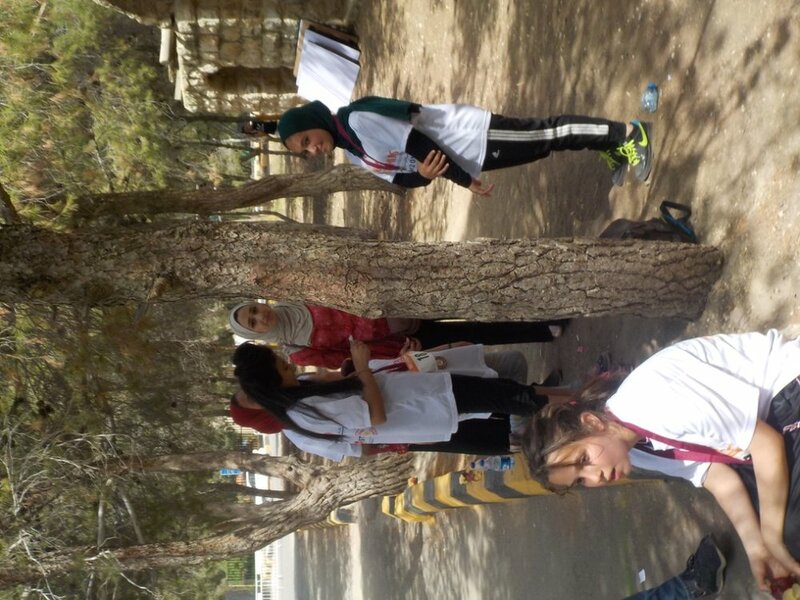 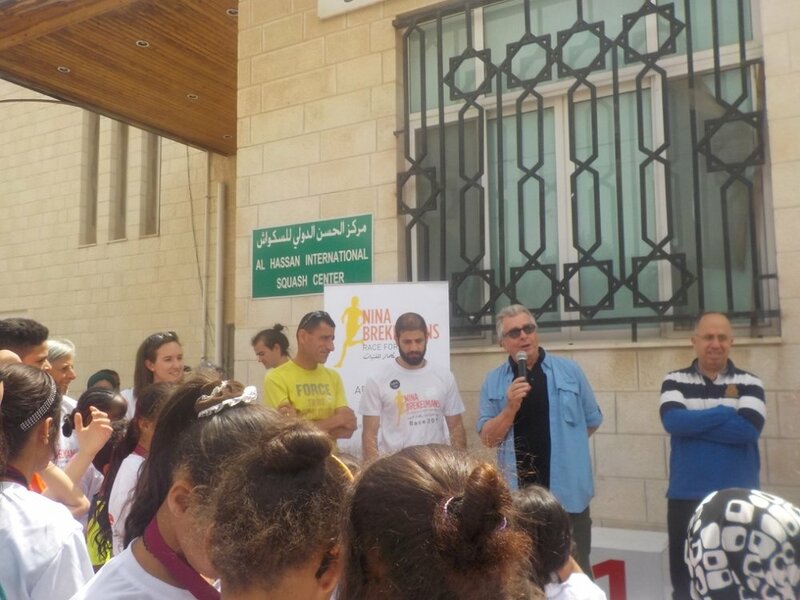 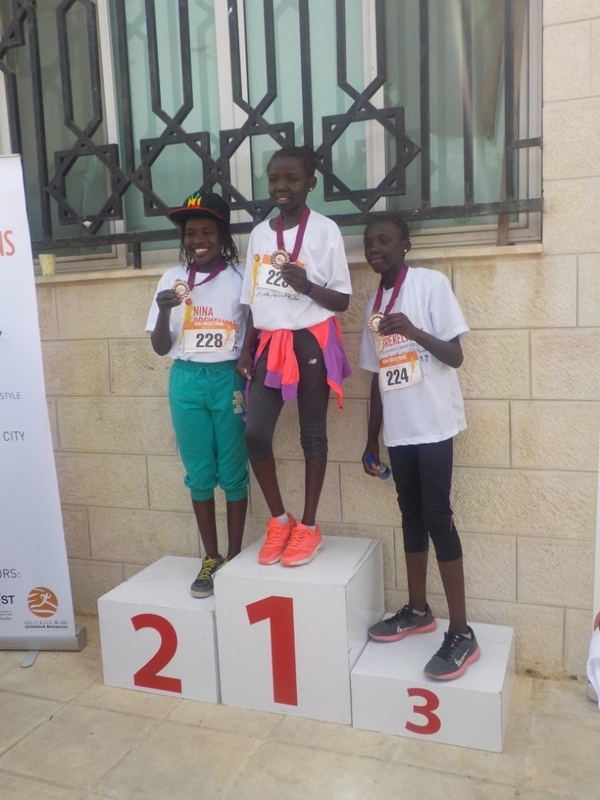 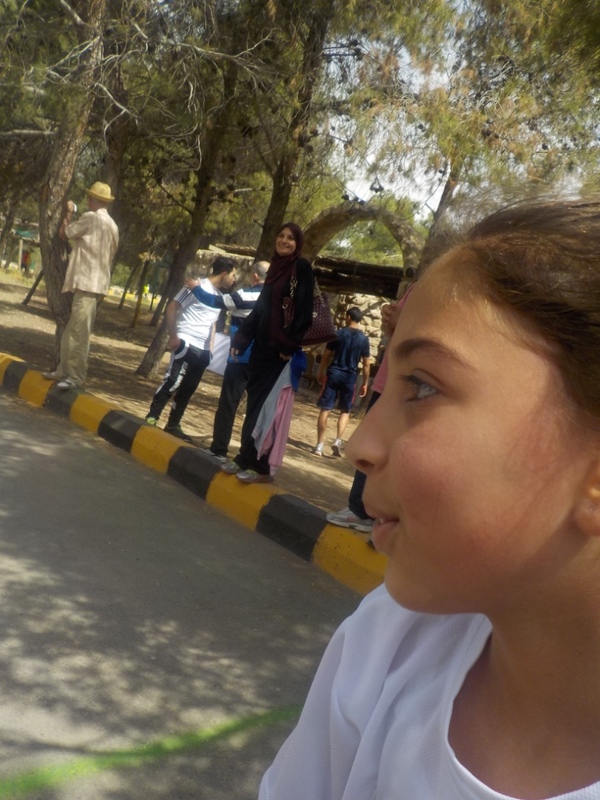 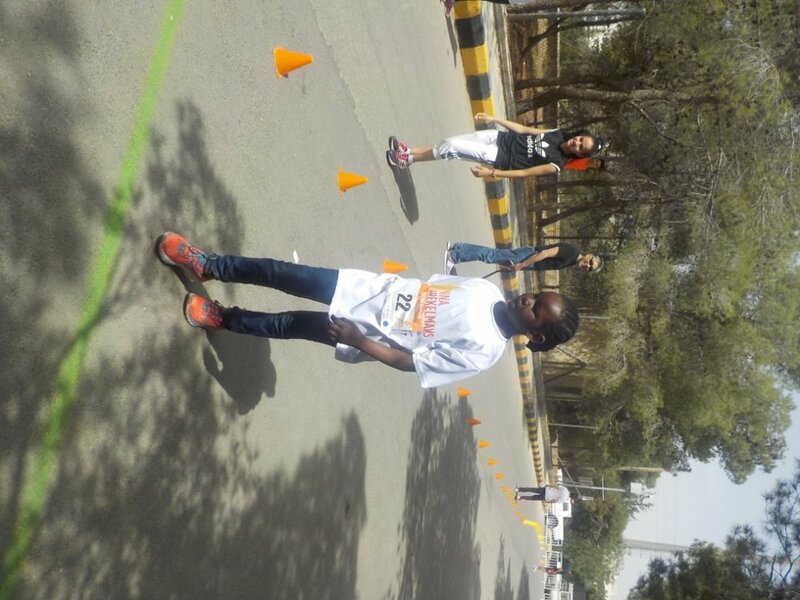 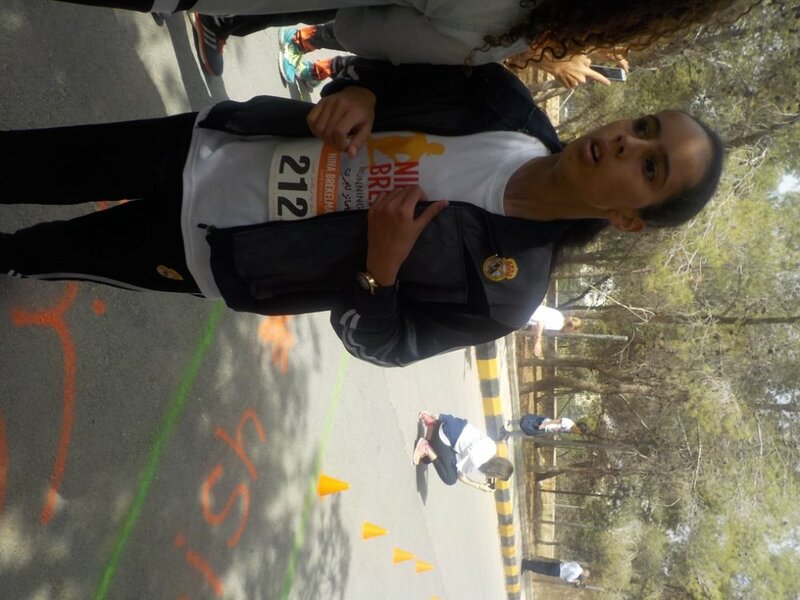 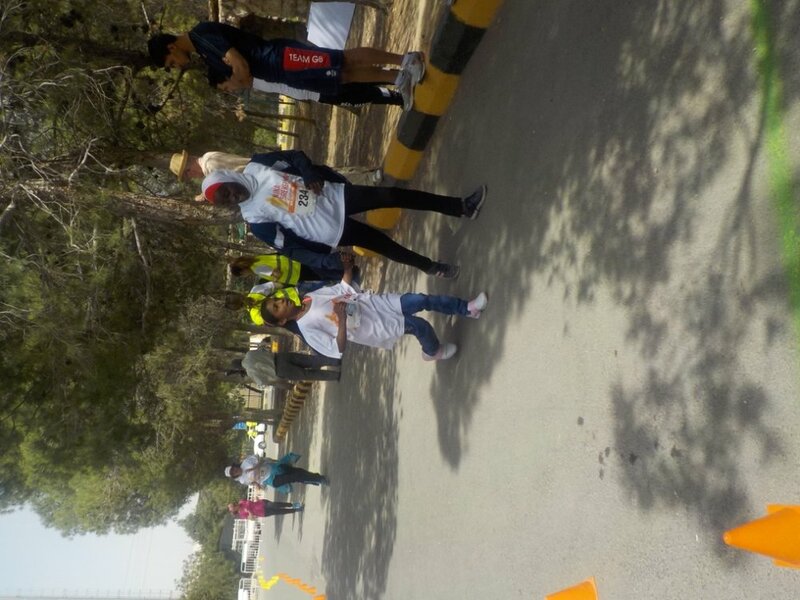 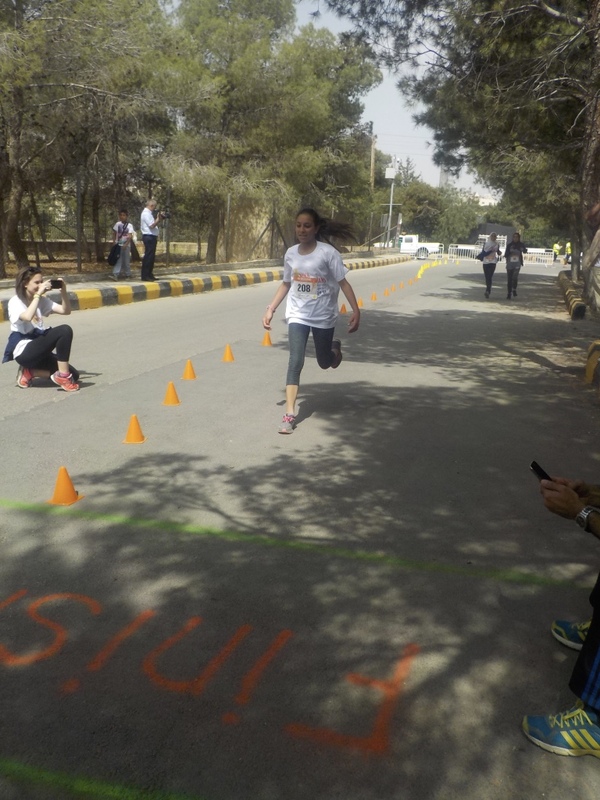 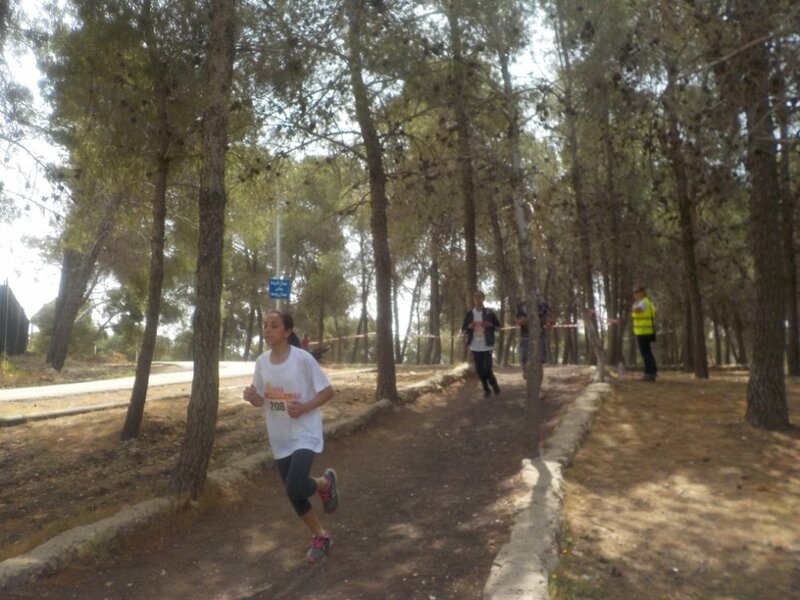 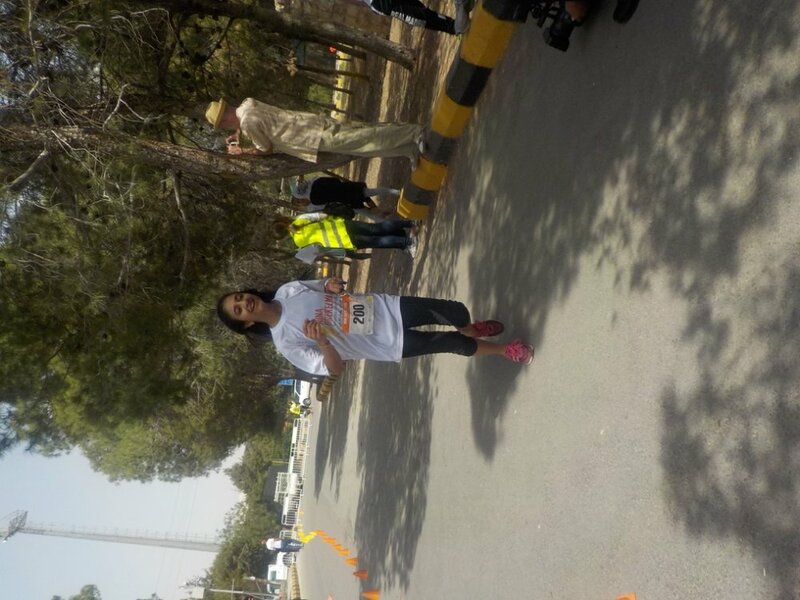 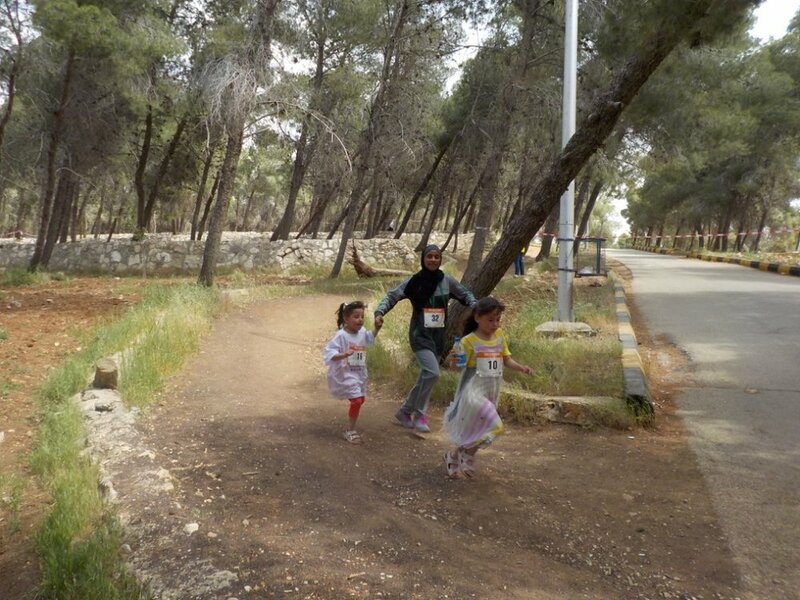 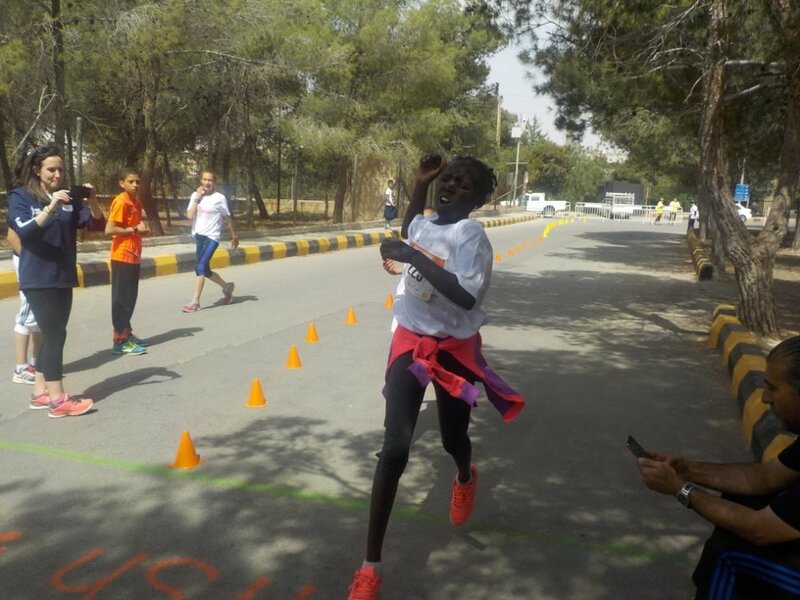 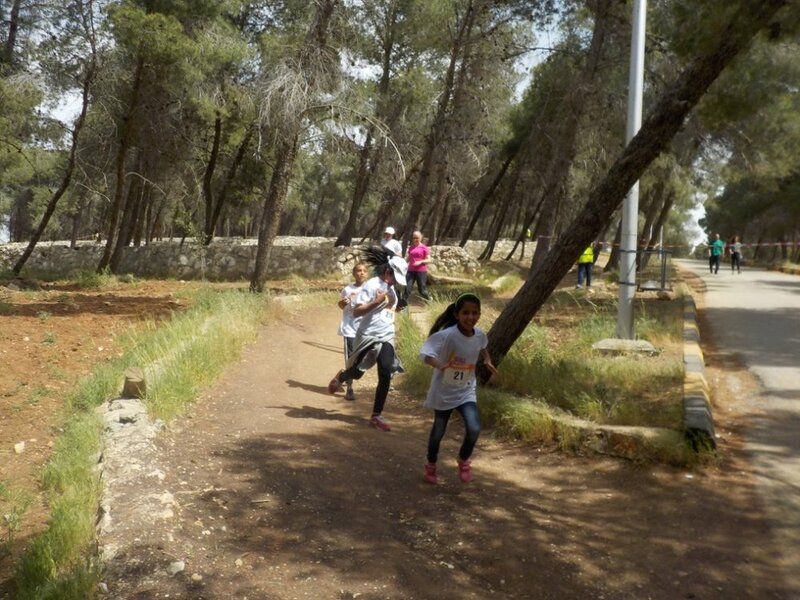 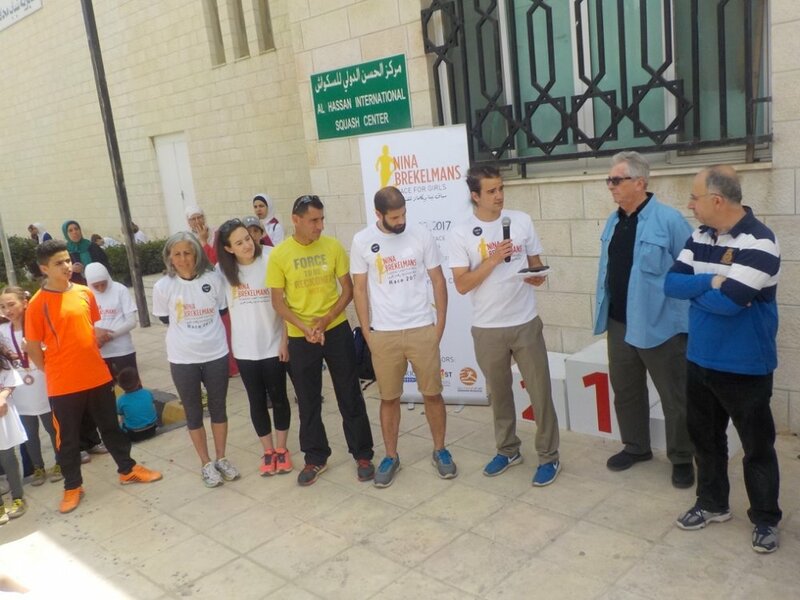 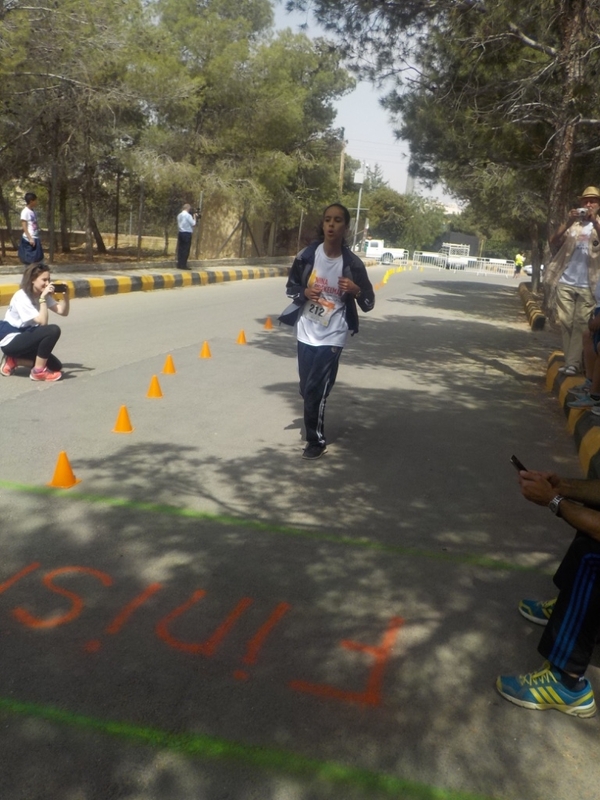 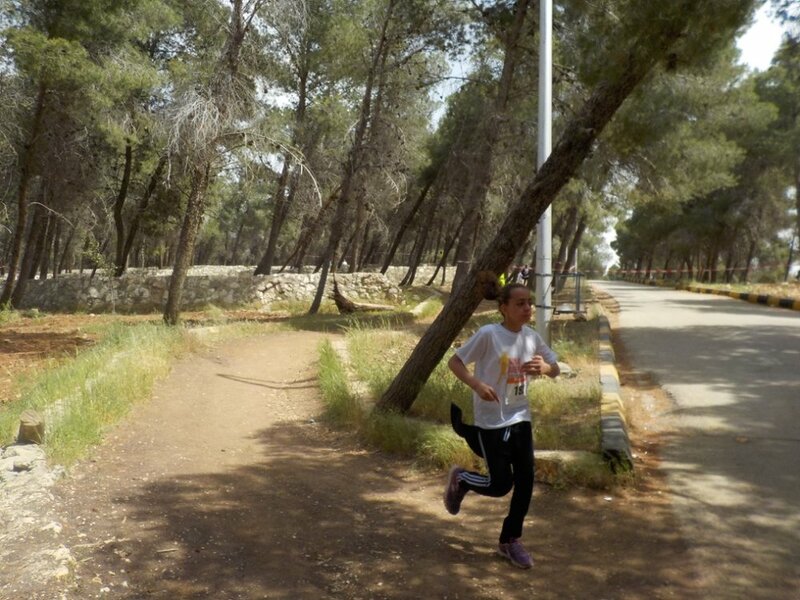 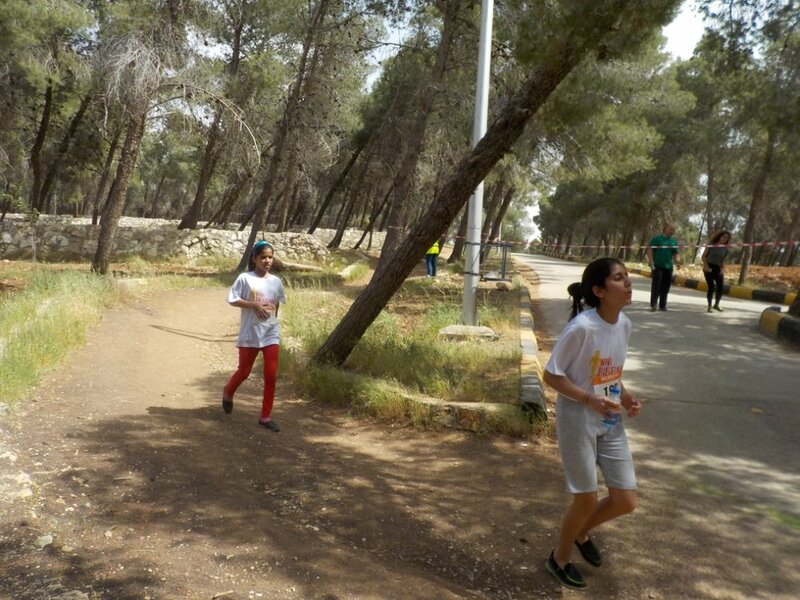 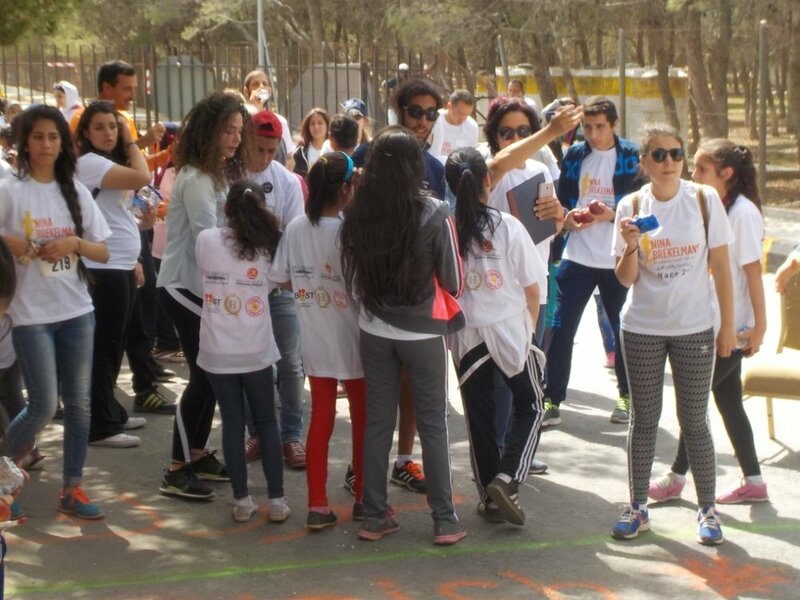 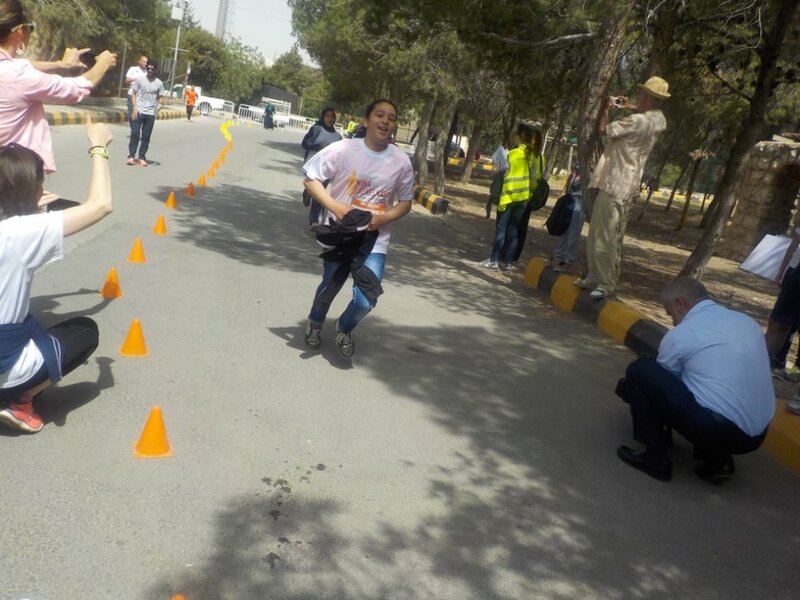 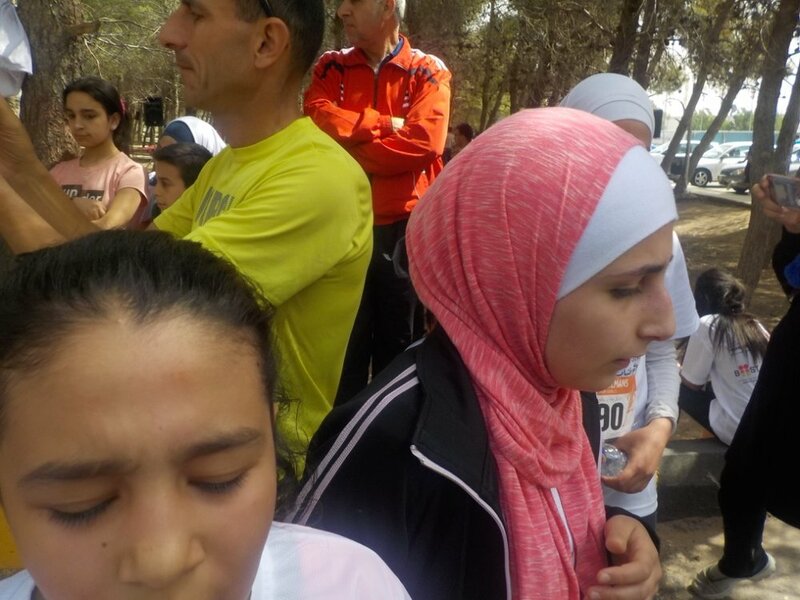 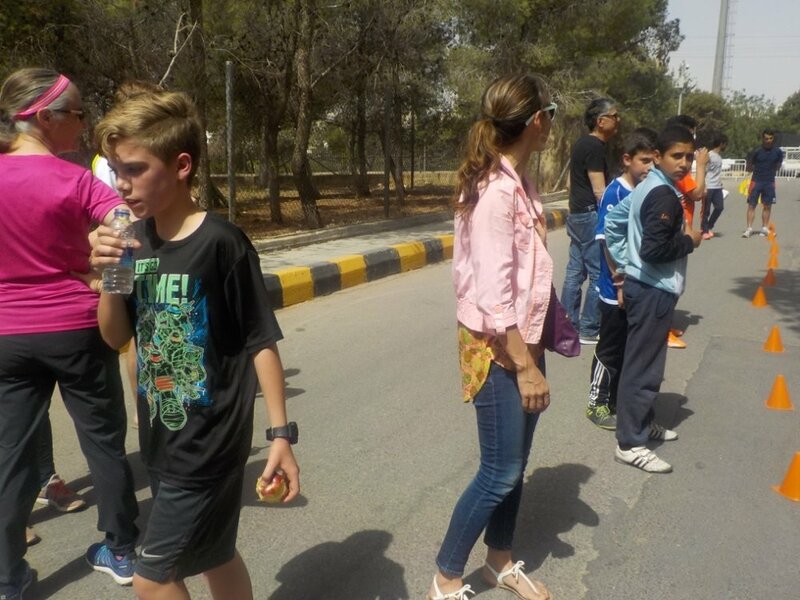 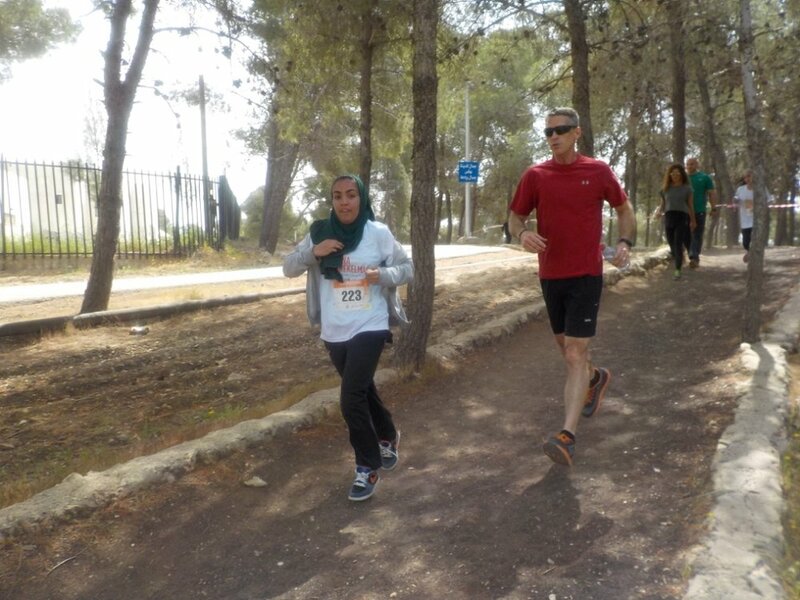 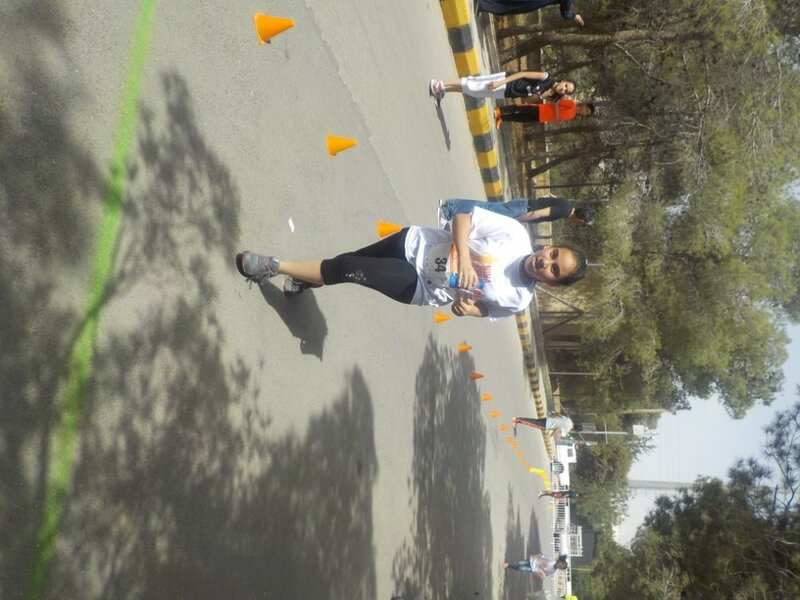 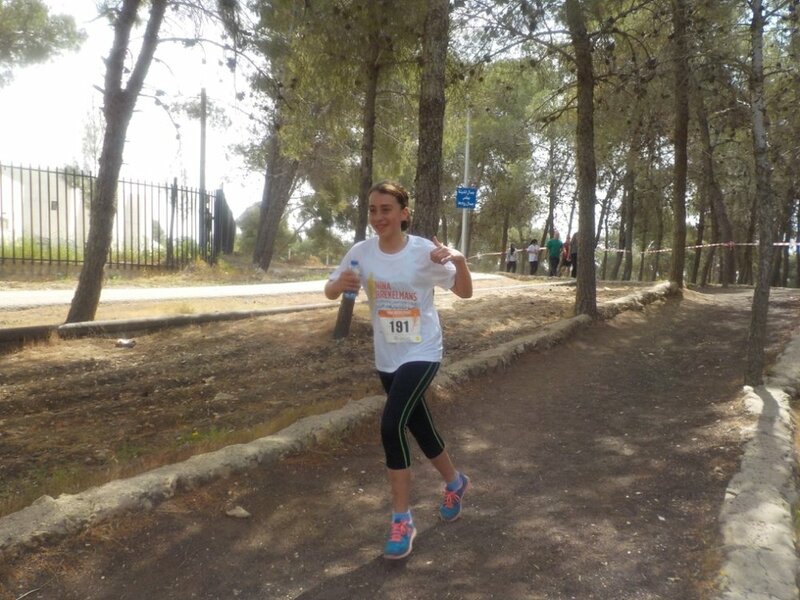 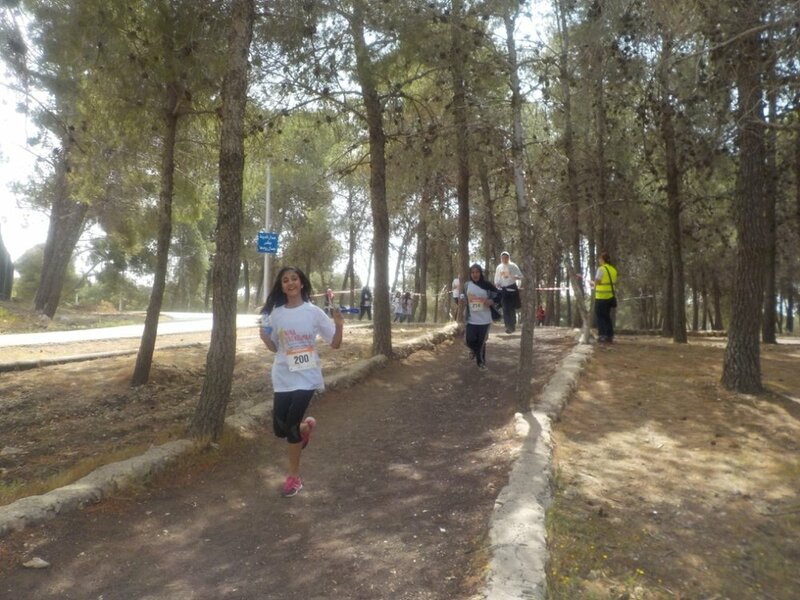 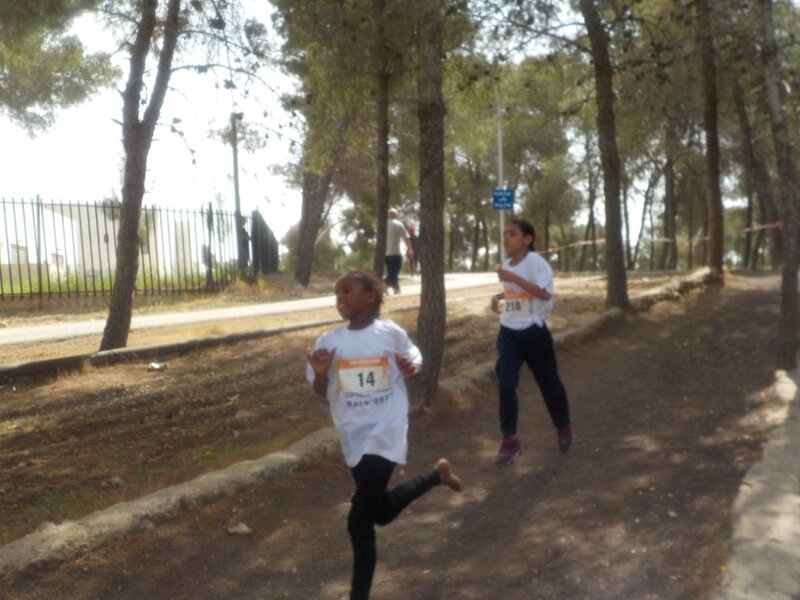 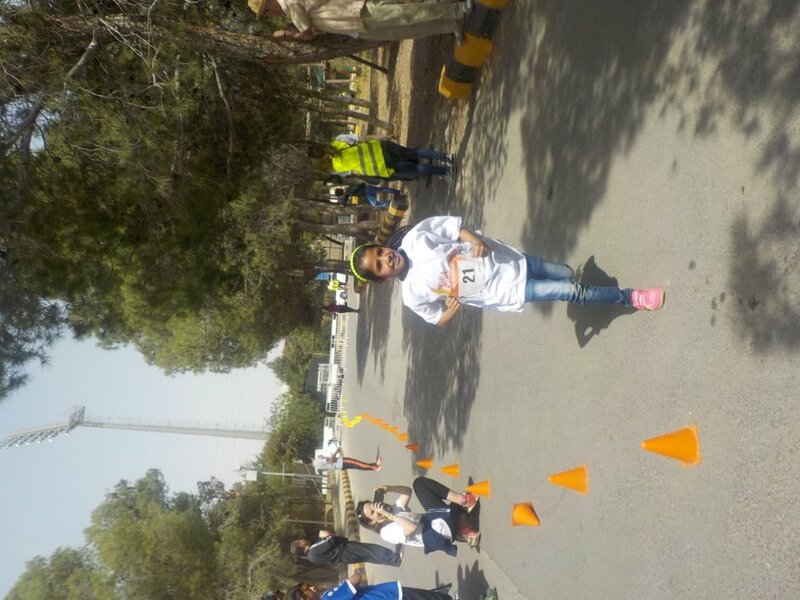 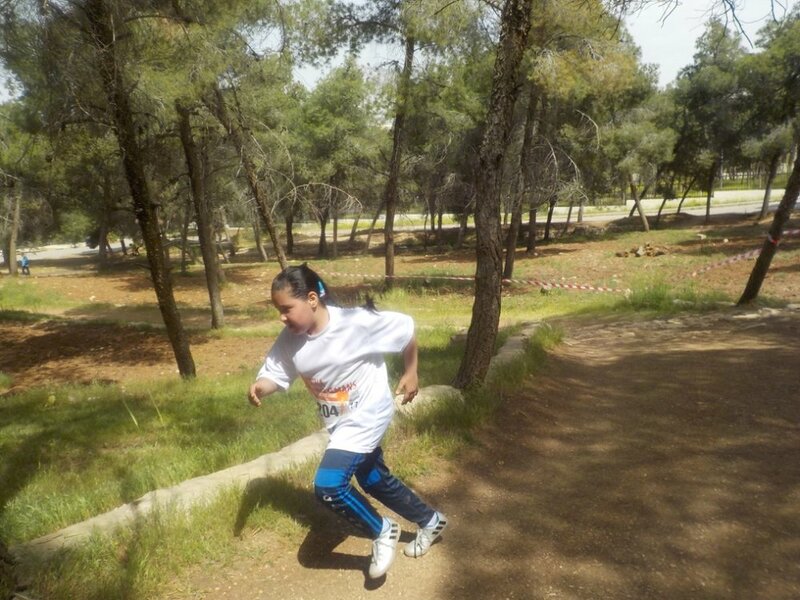 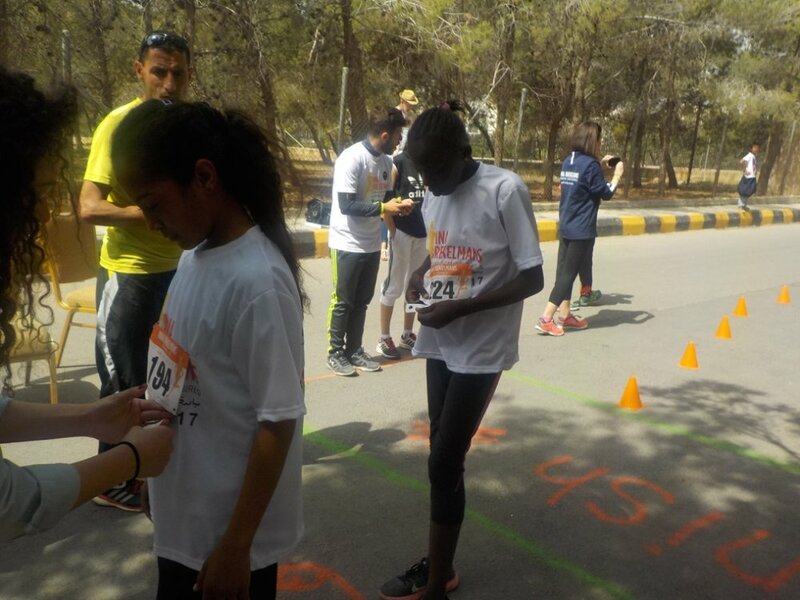 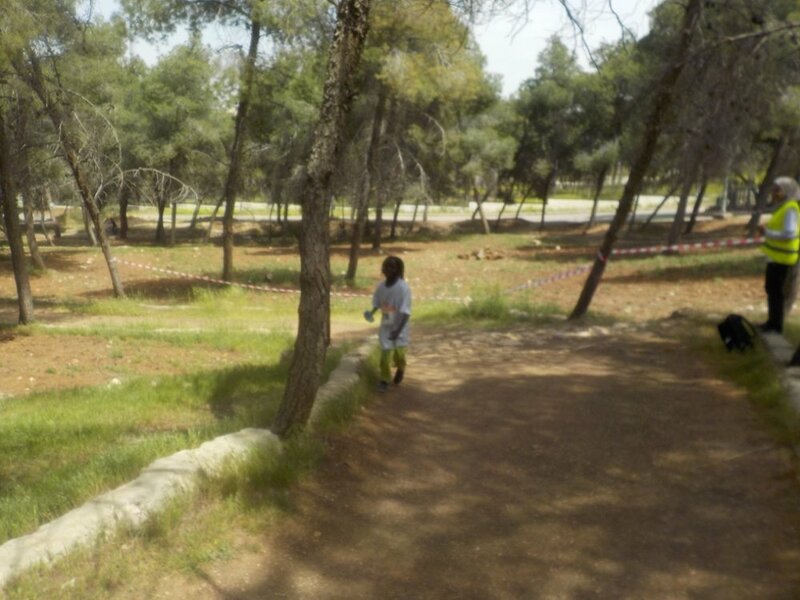 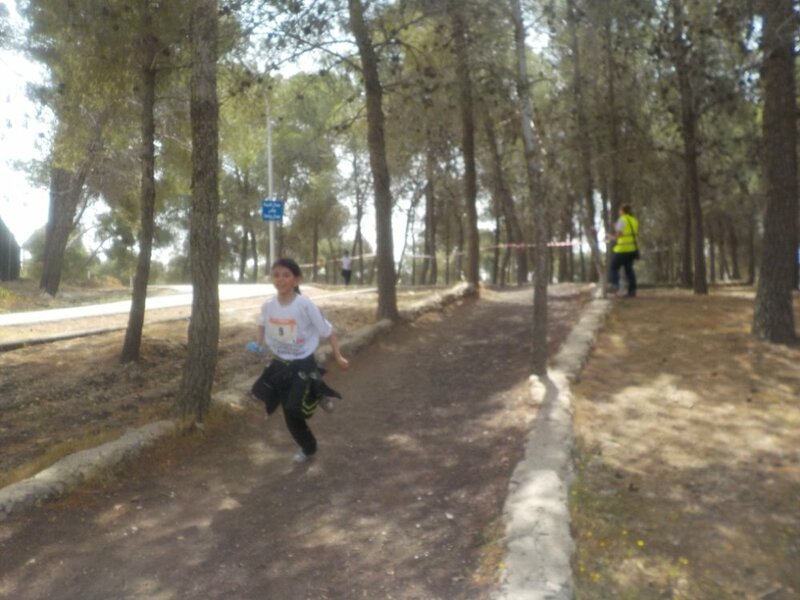 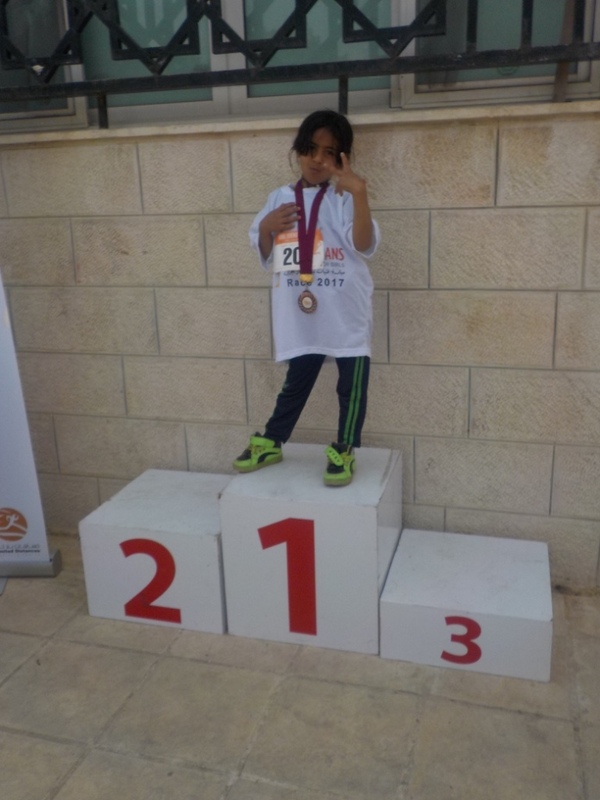 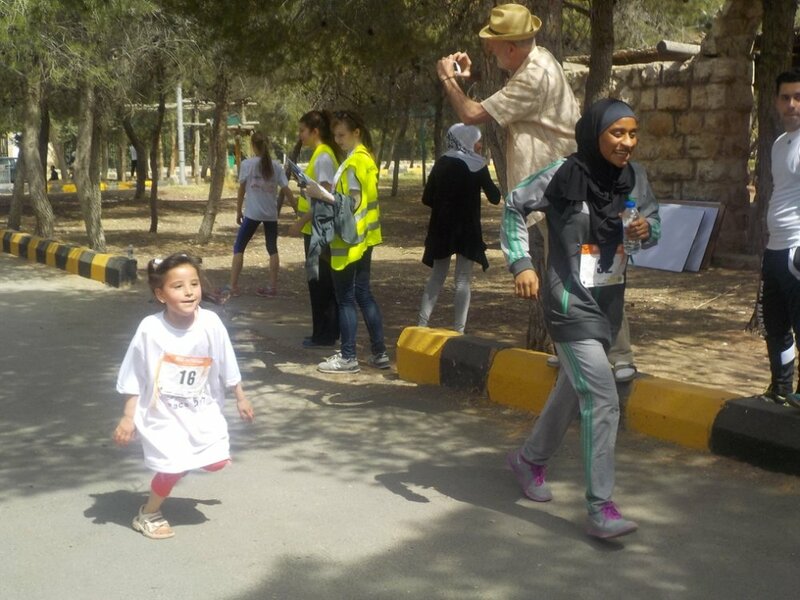 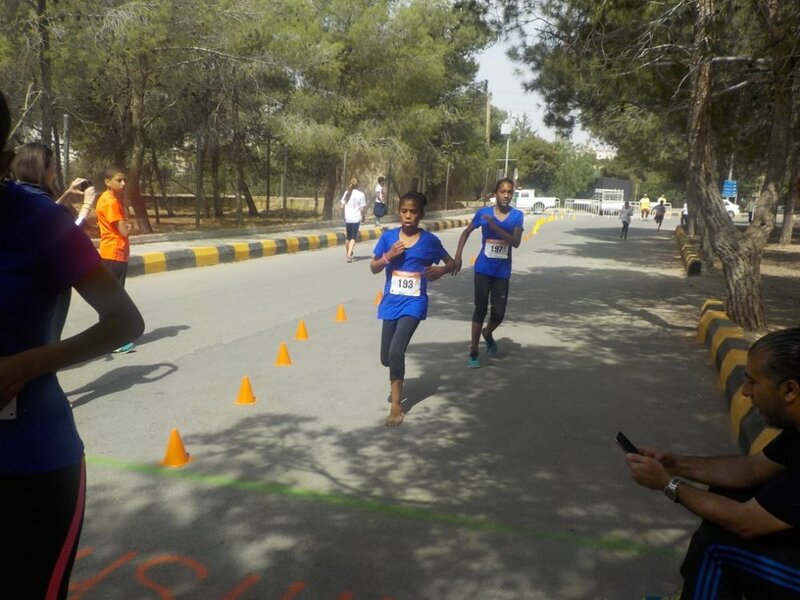 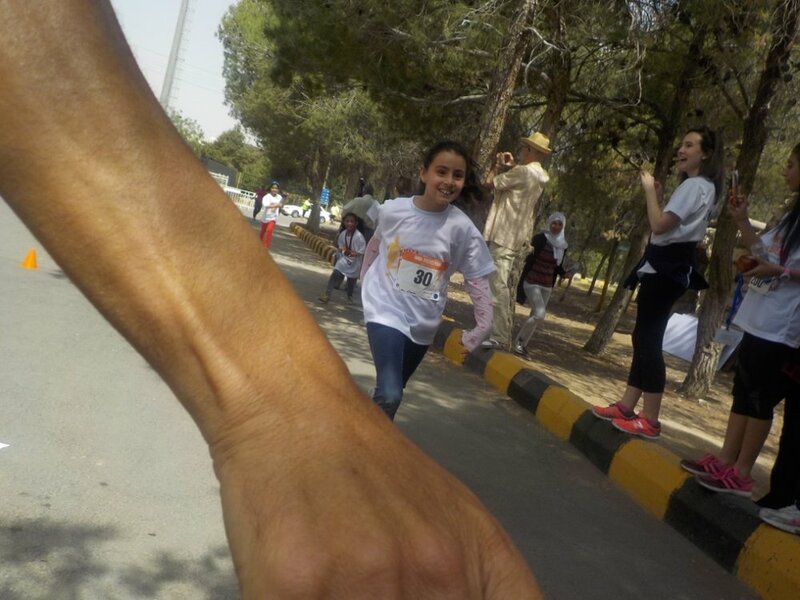 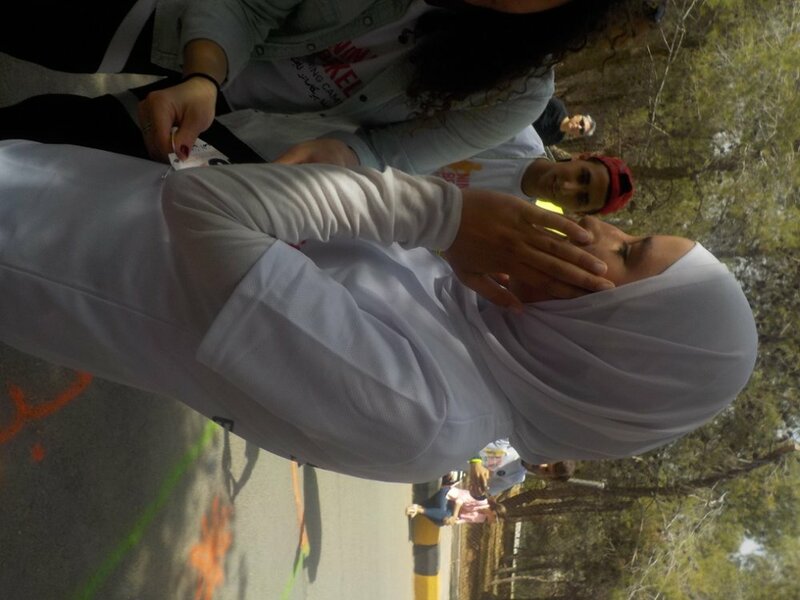 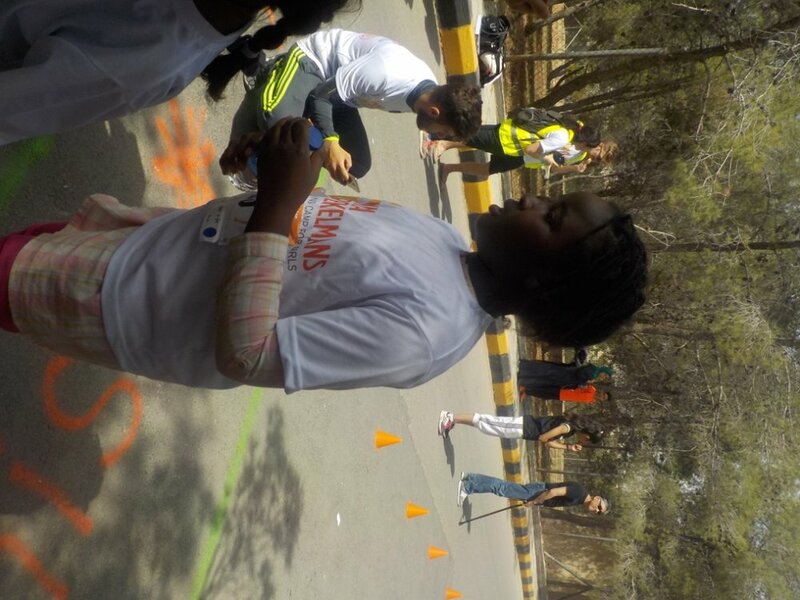 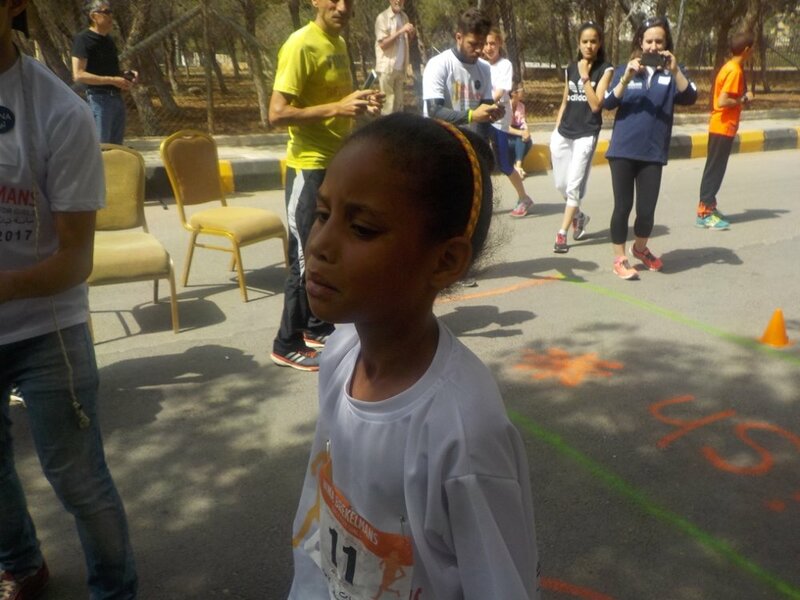 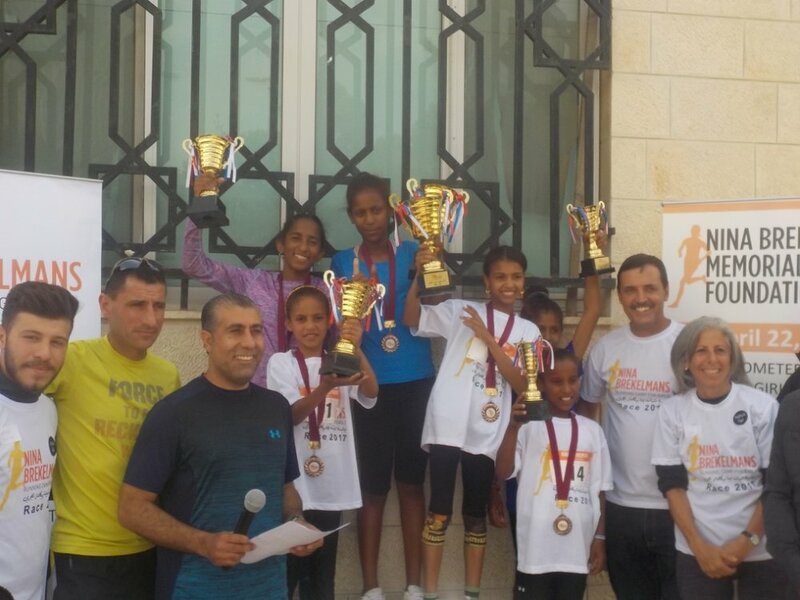 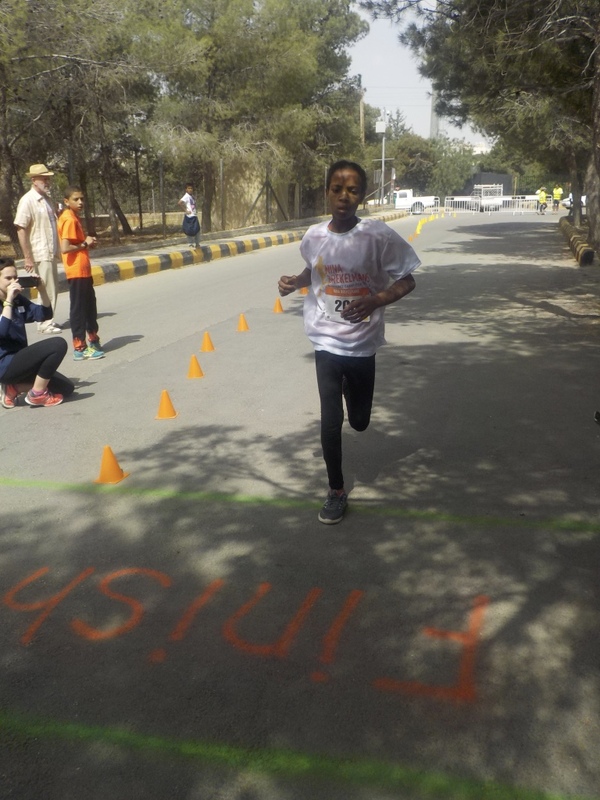 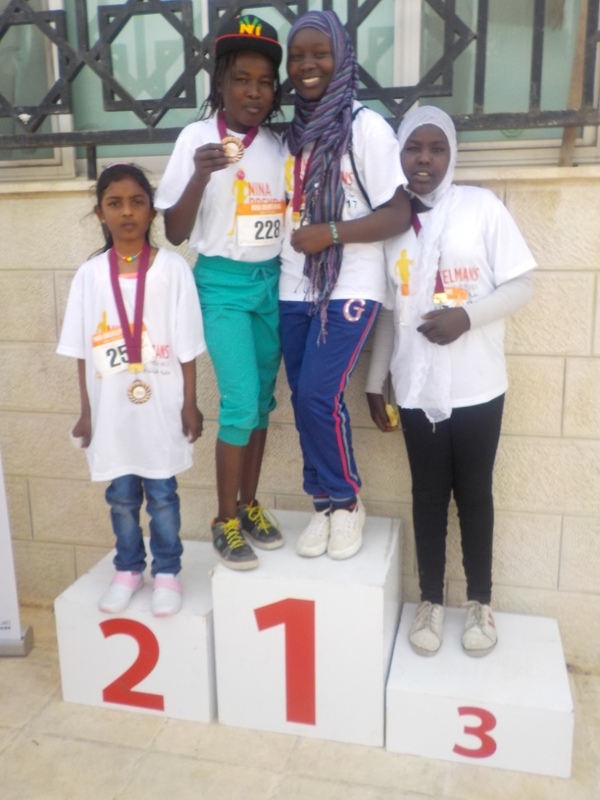 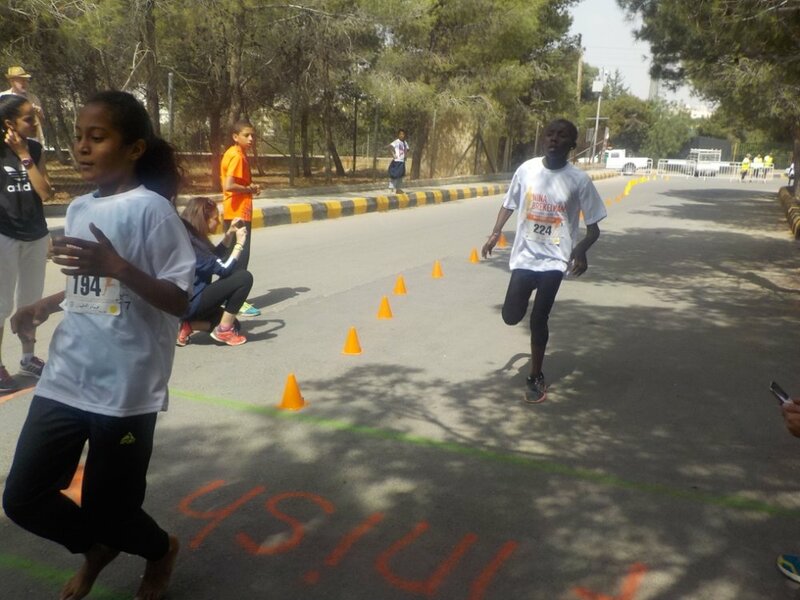 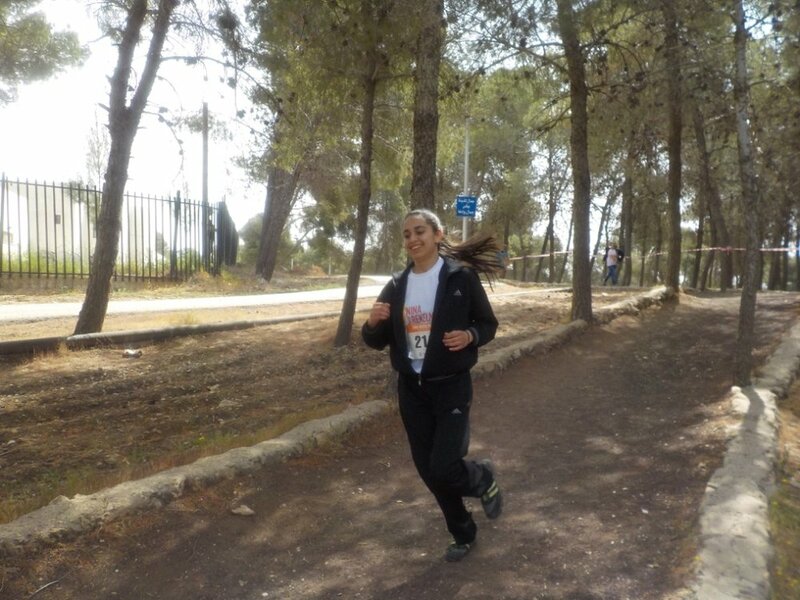 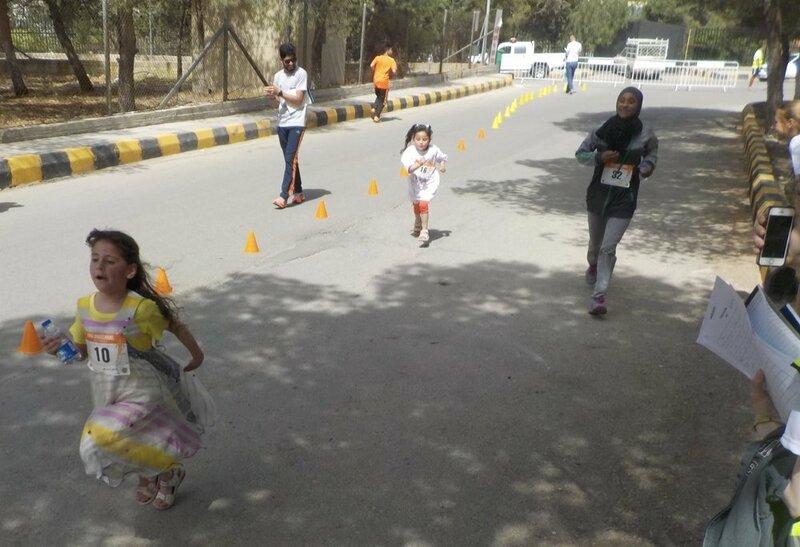 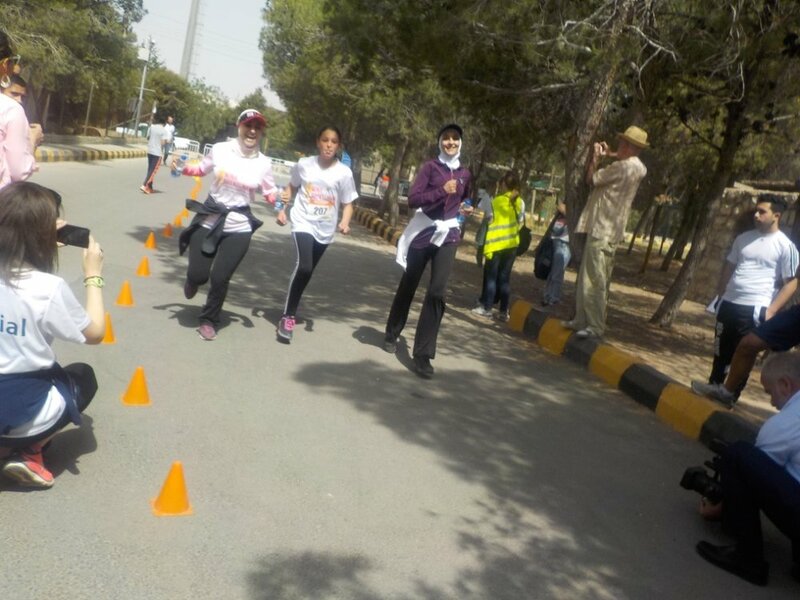 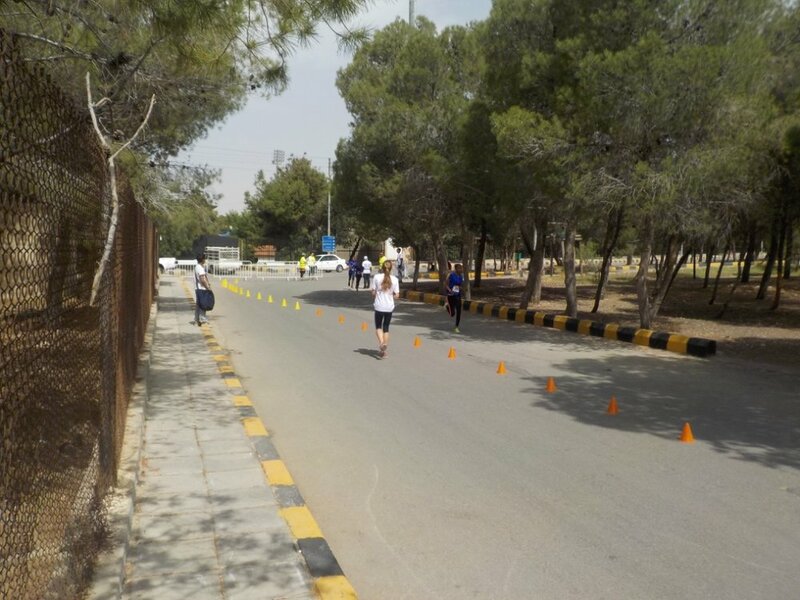 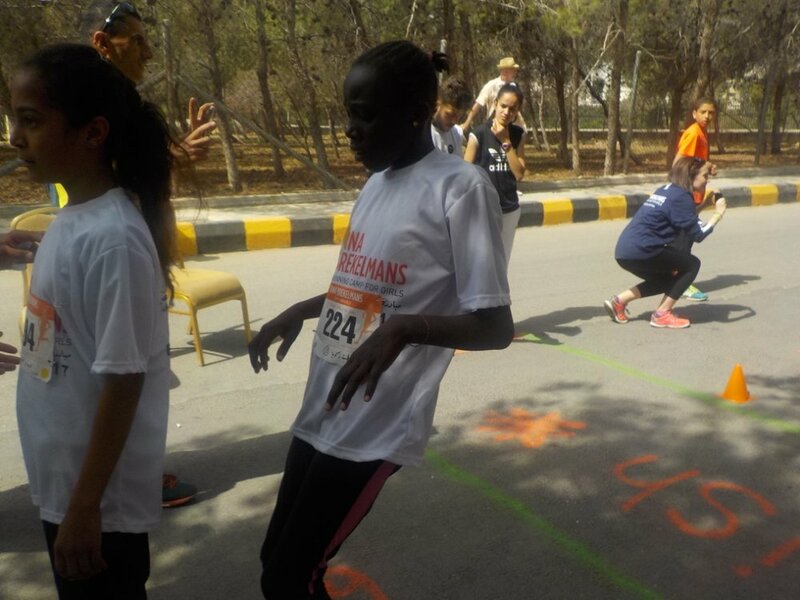 The special attendance of Farah Hashem, Tamara Armoush, Georgia Cottle, and Hanoia Ali—all award-winning runners in Jordan—helped boost the girls’ energy at the start line. 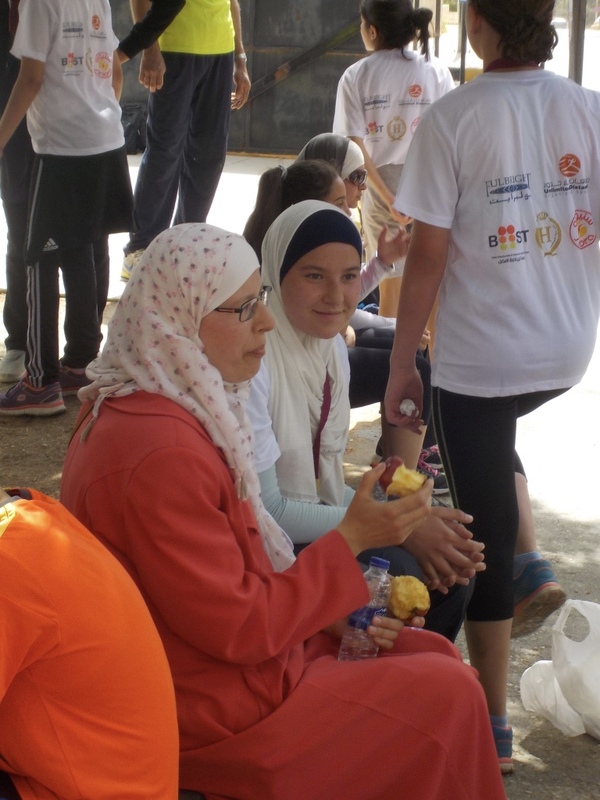 Just before the race began officials from Sports City, including Dr. Atef, arrived to make brief speeches, wish the girls well, and take pictures with the girls as well as Nina’s family. 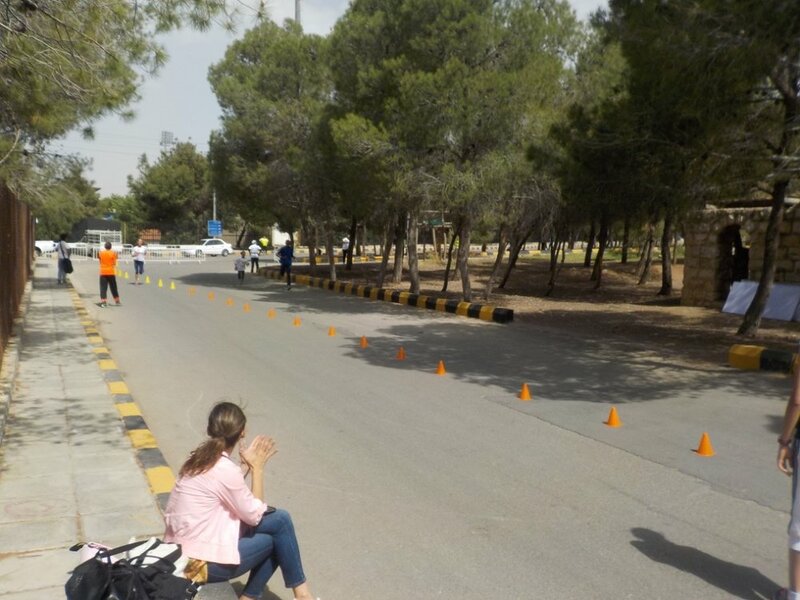 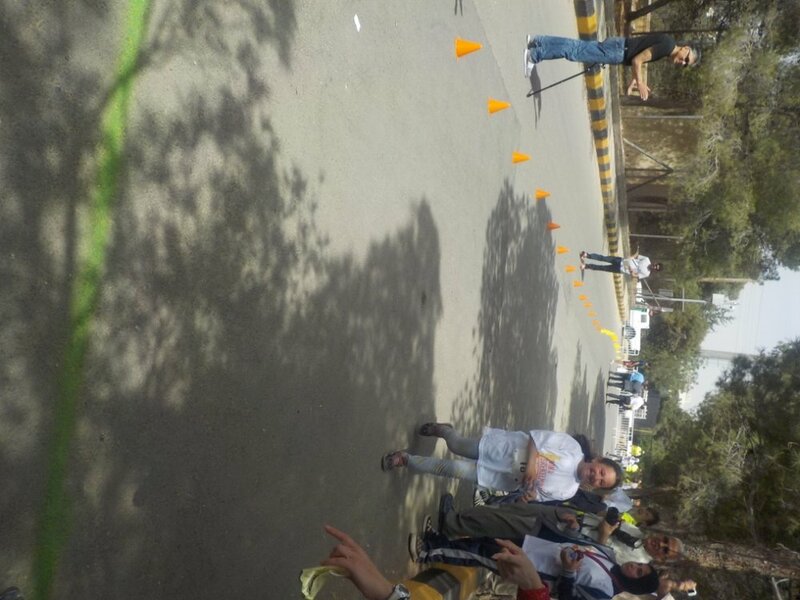 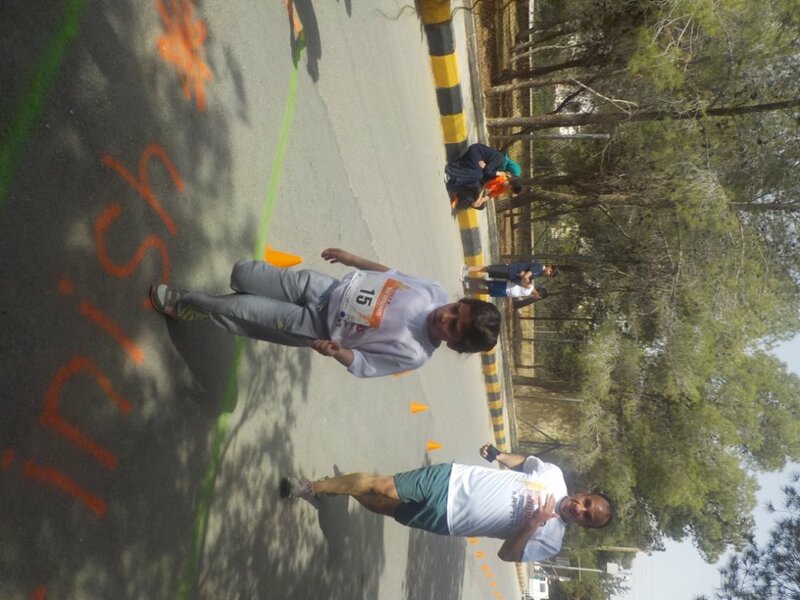 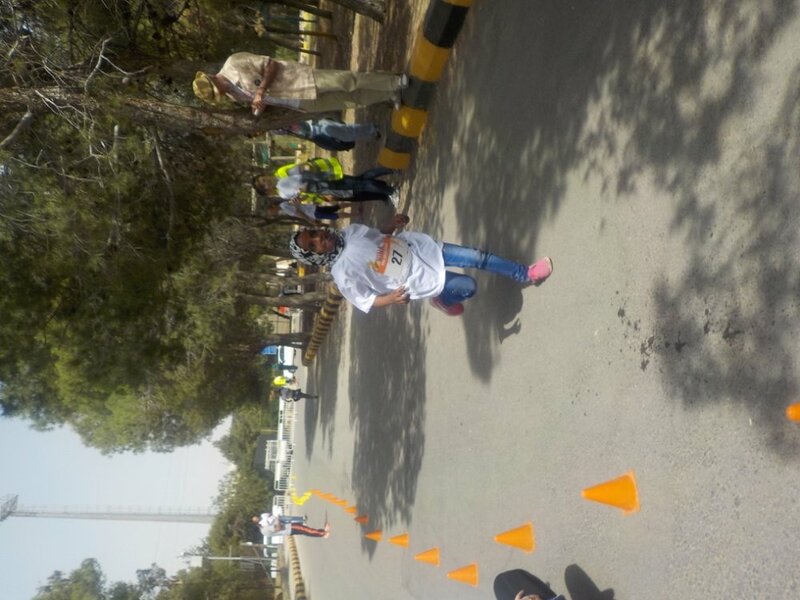 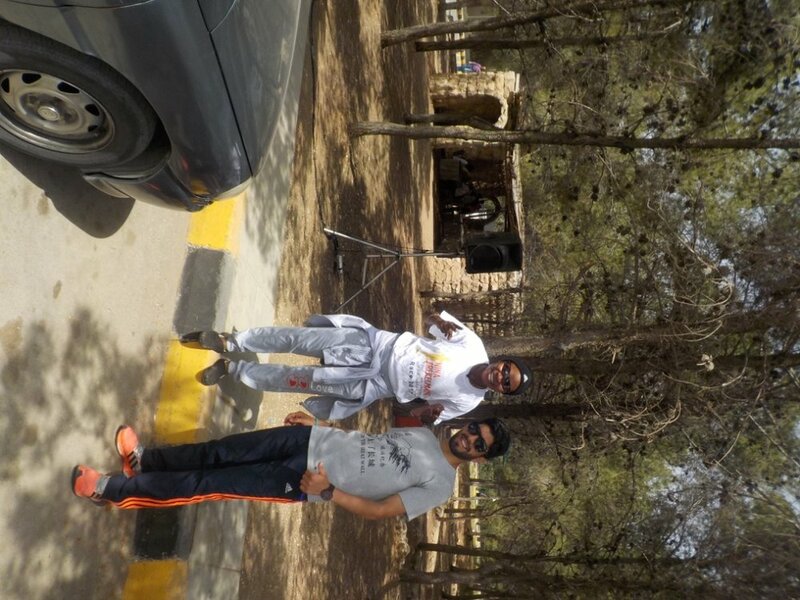 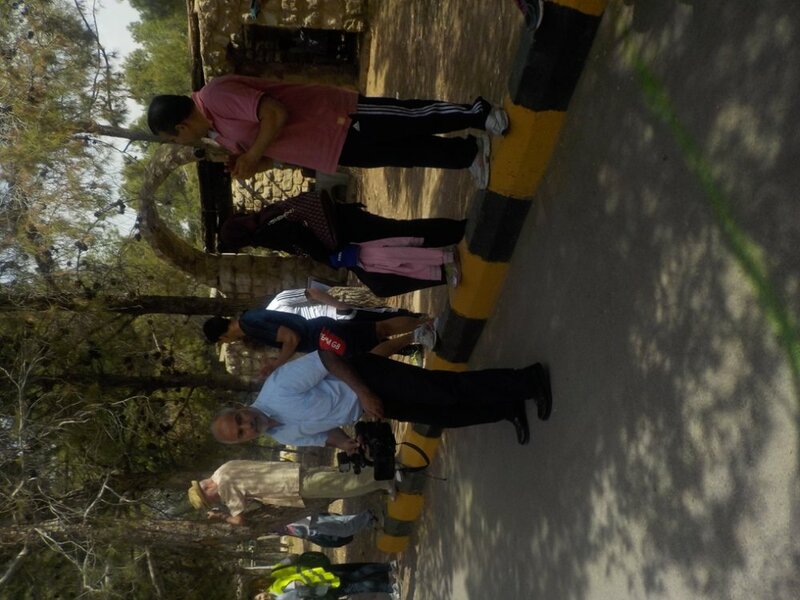 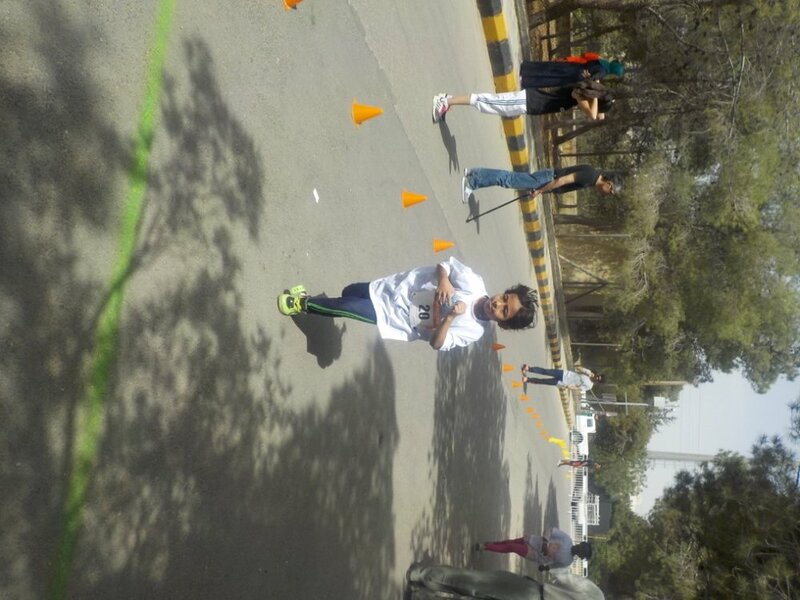 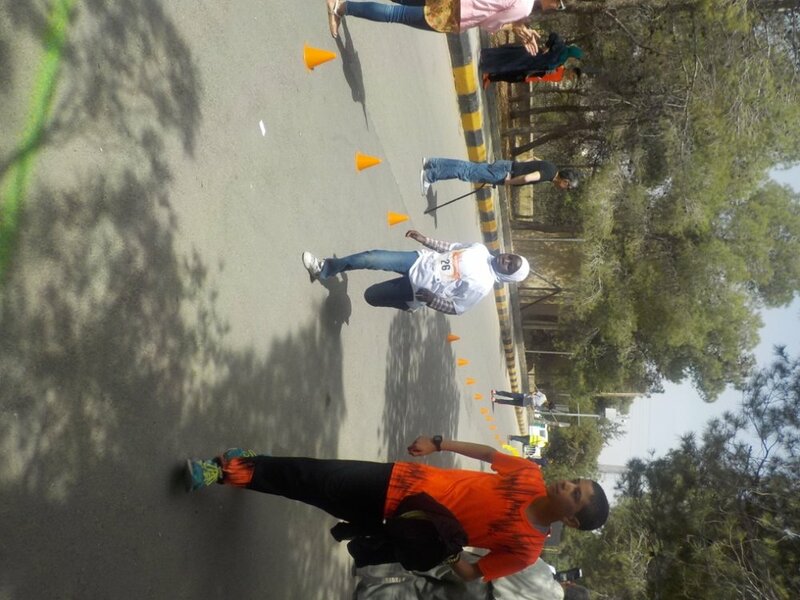 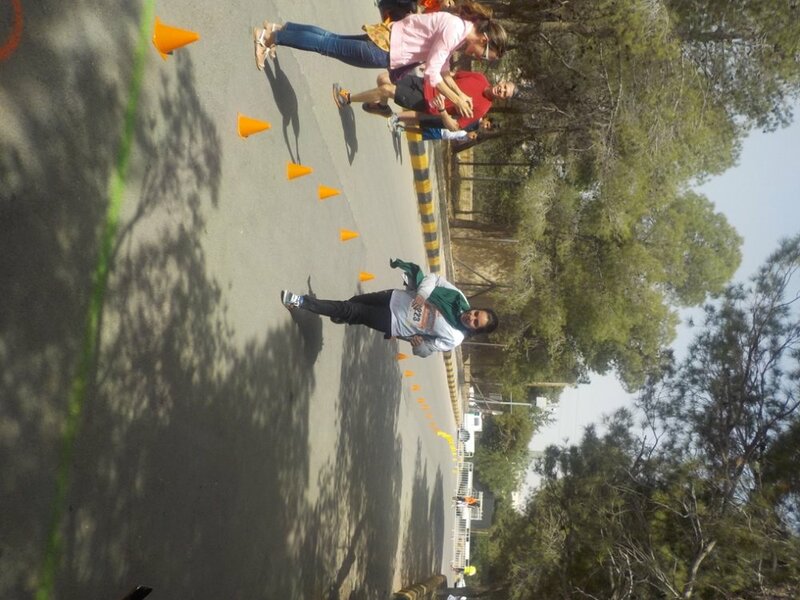 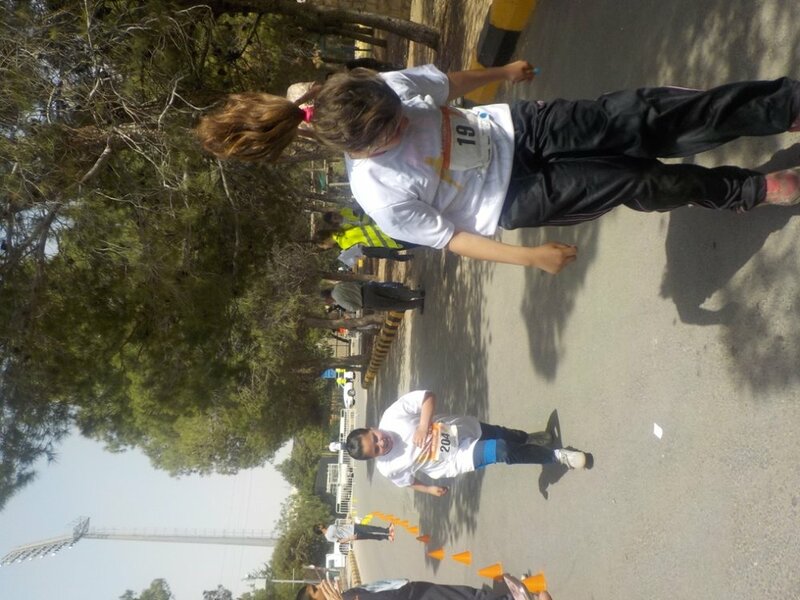 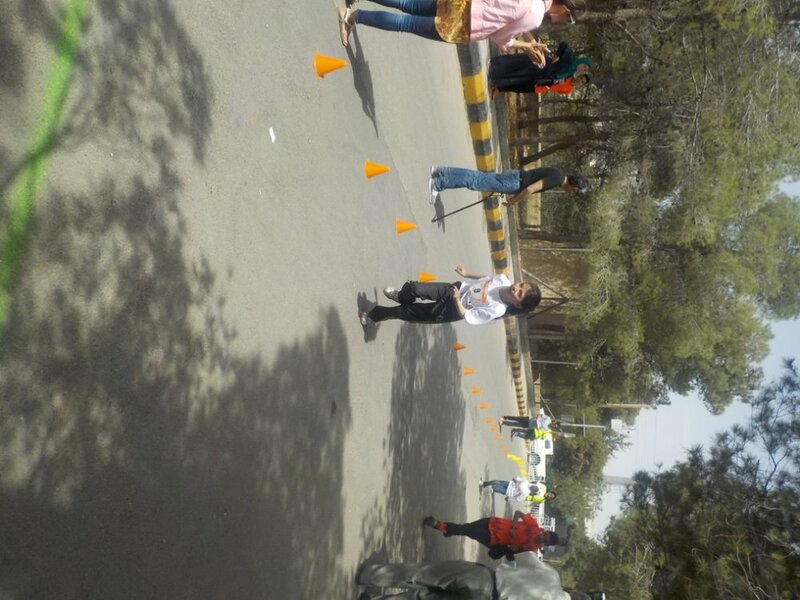 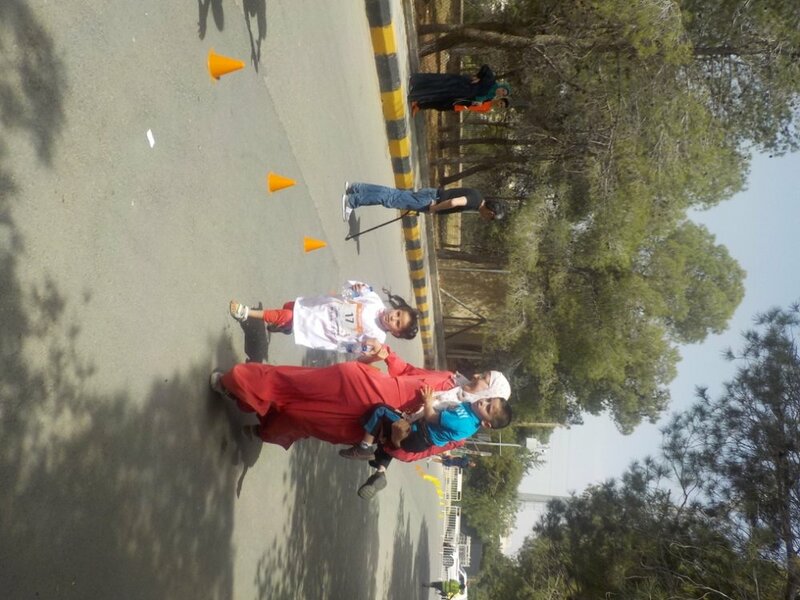 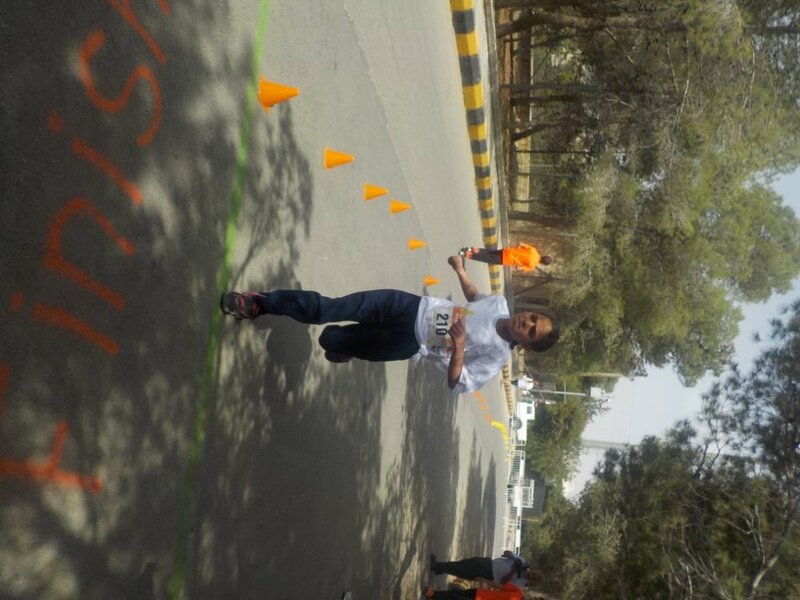 Then, with three loud horn bellows, Captain Waleed from Sports City’s Squash Federation started the race. 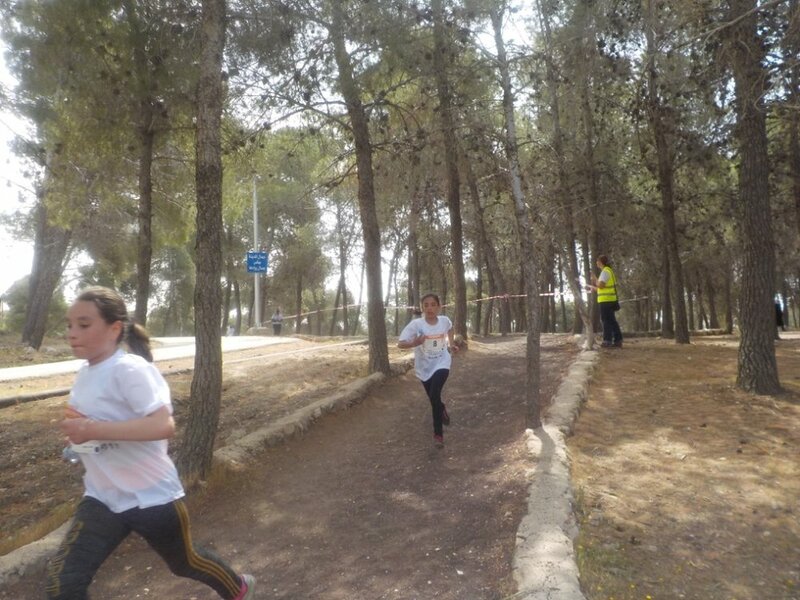 The girls took off at a sprinting pace as the crowd clapped and cheered. 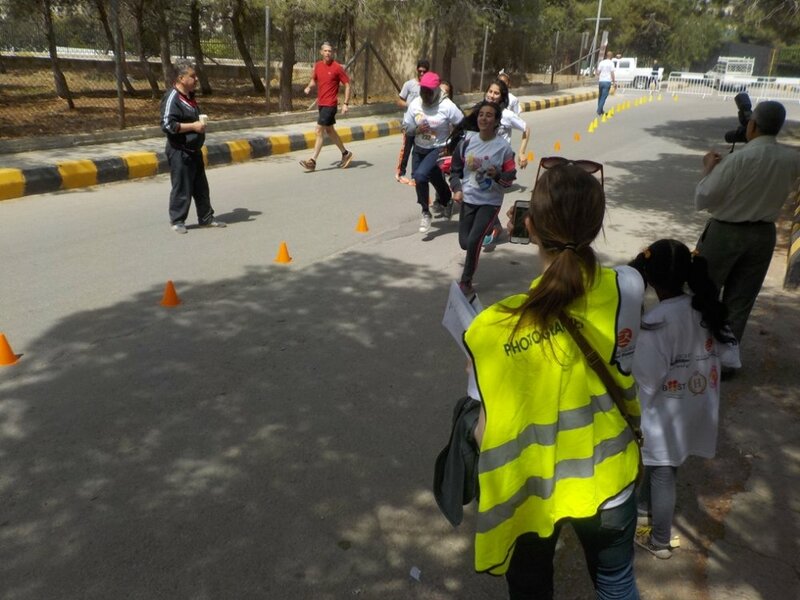 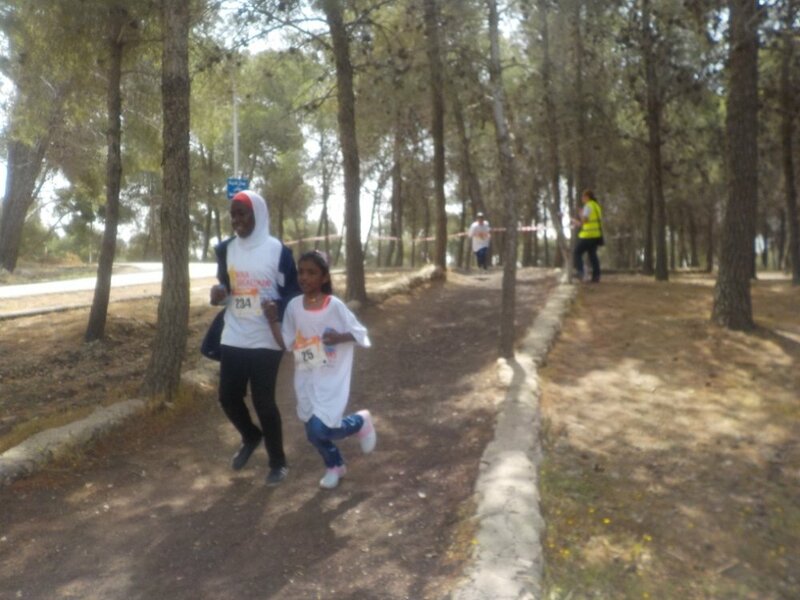 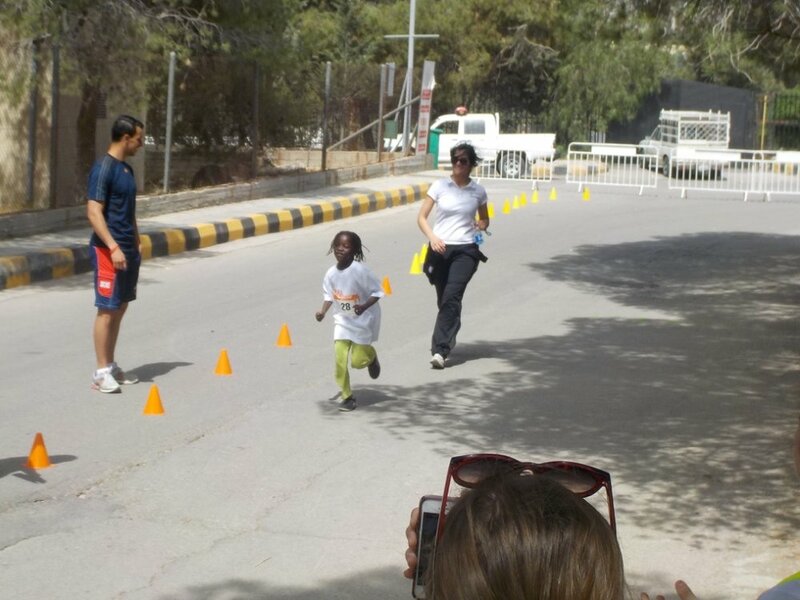 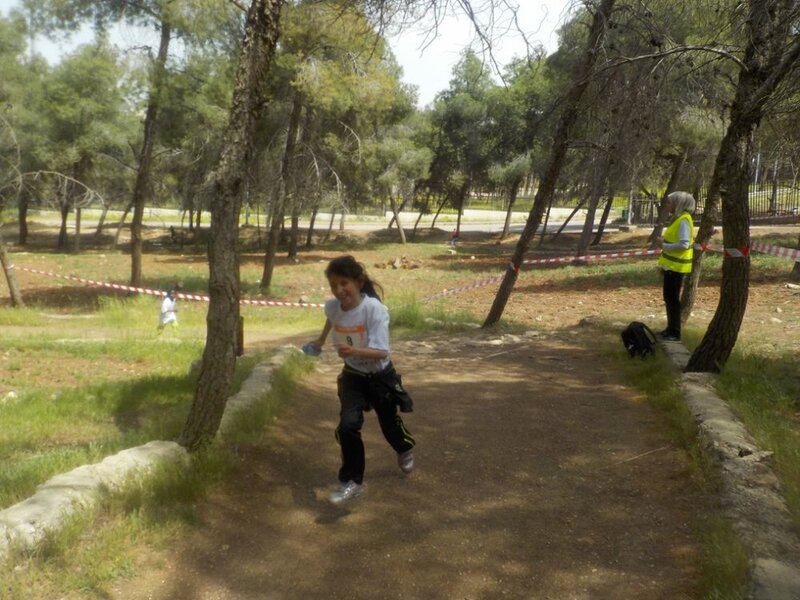 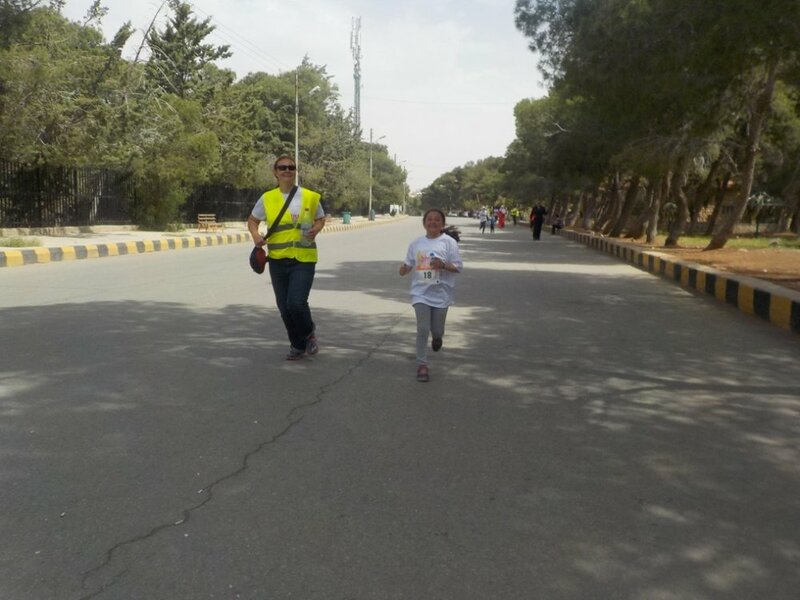 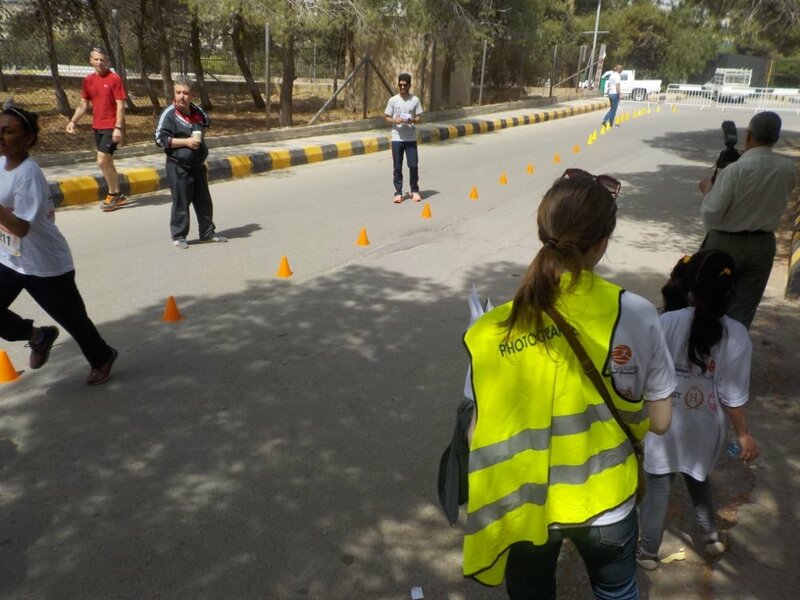 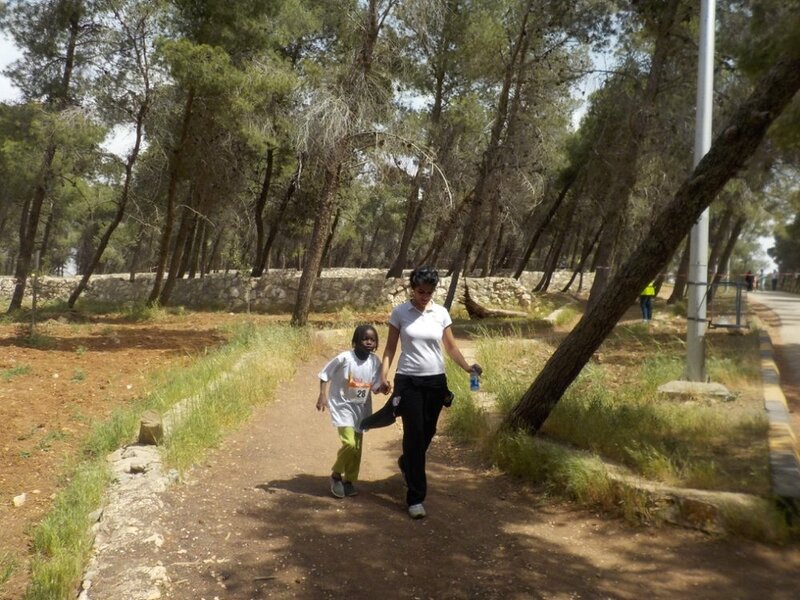 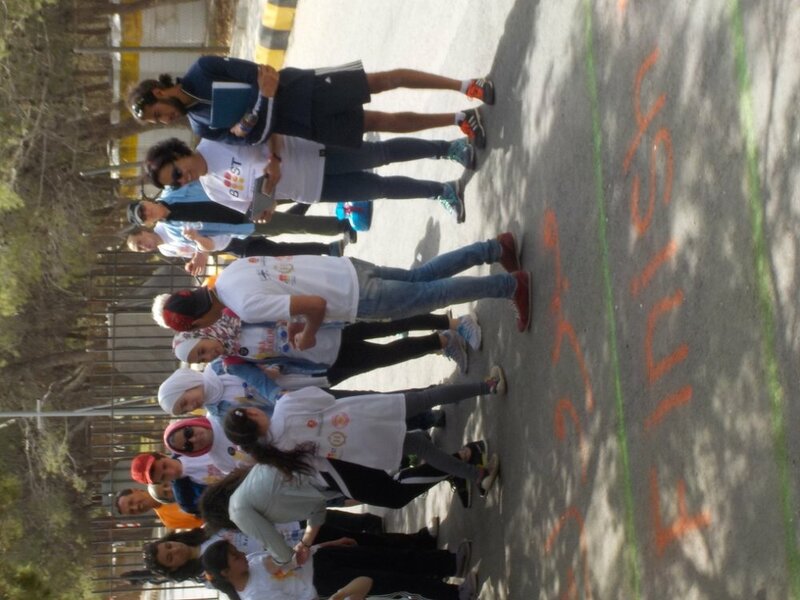 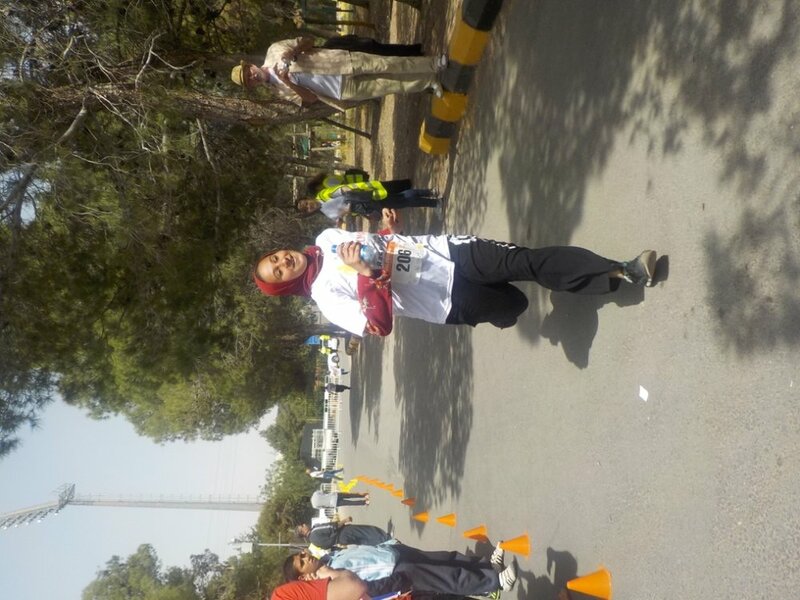 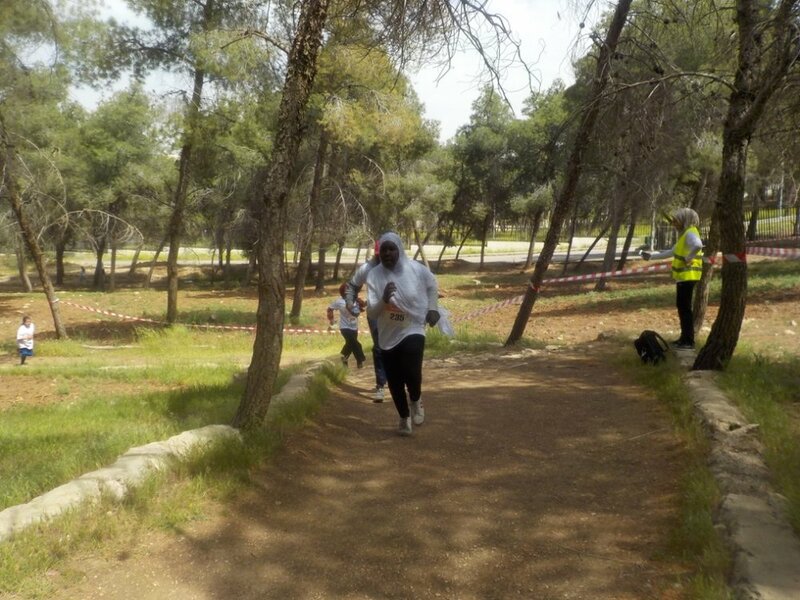 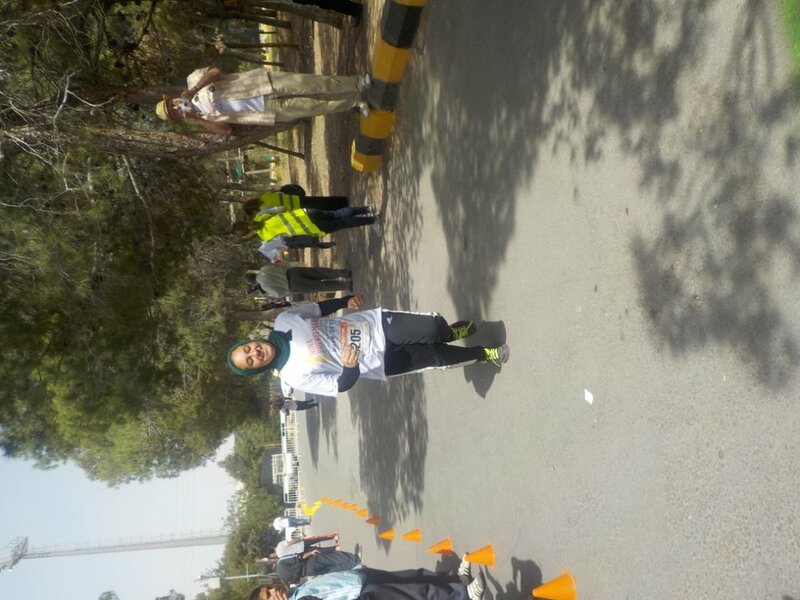 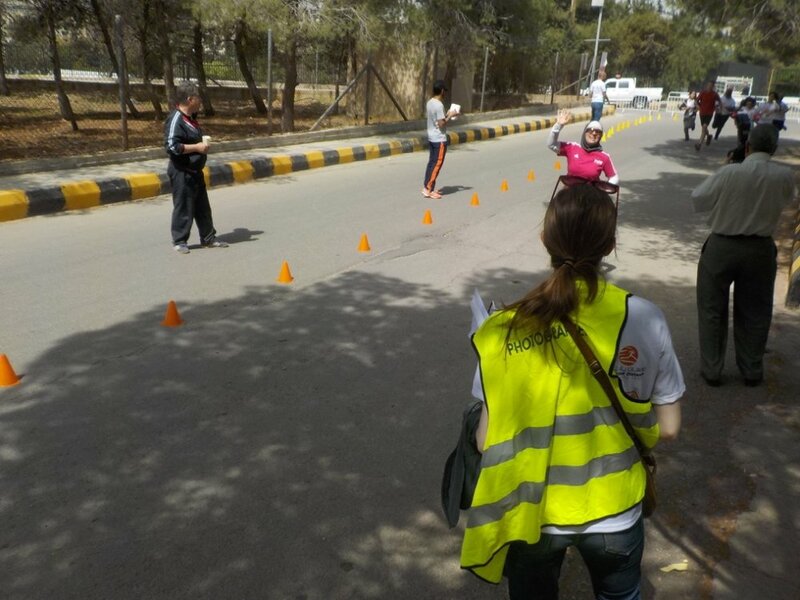 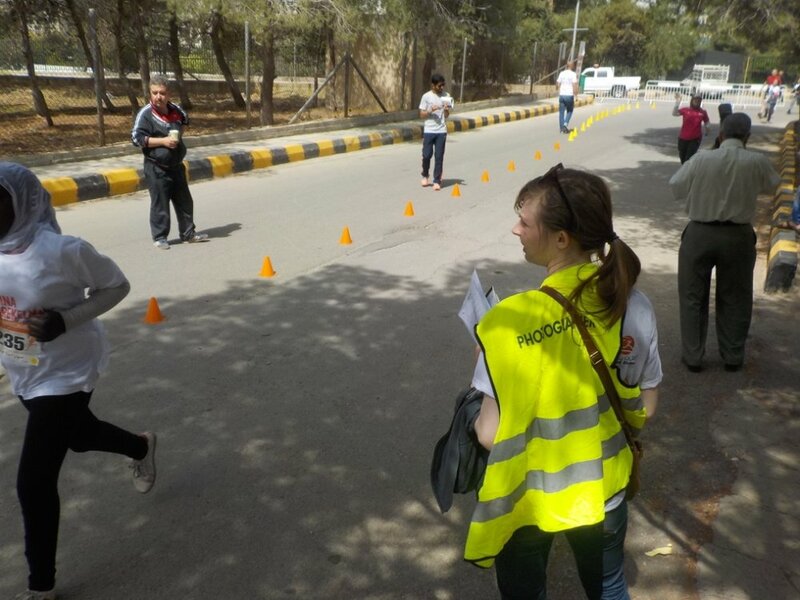 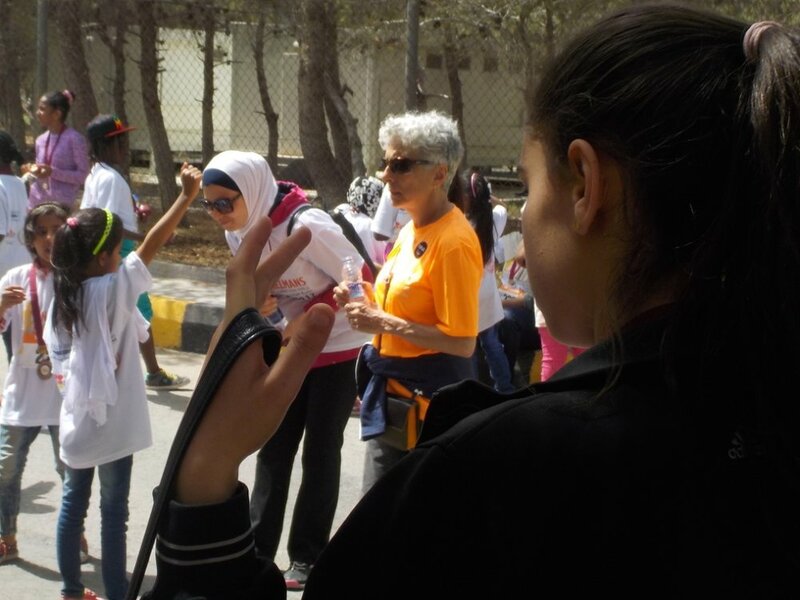 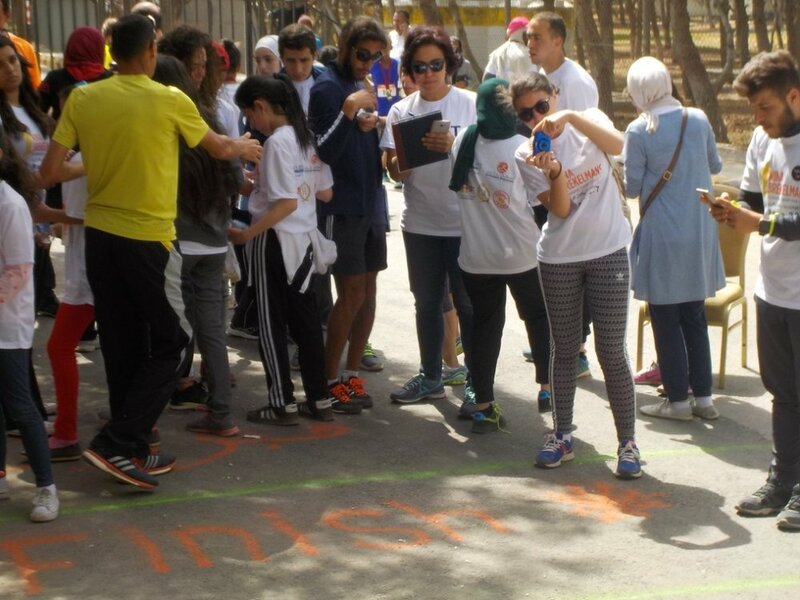 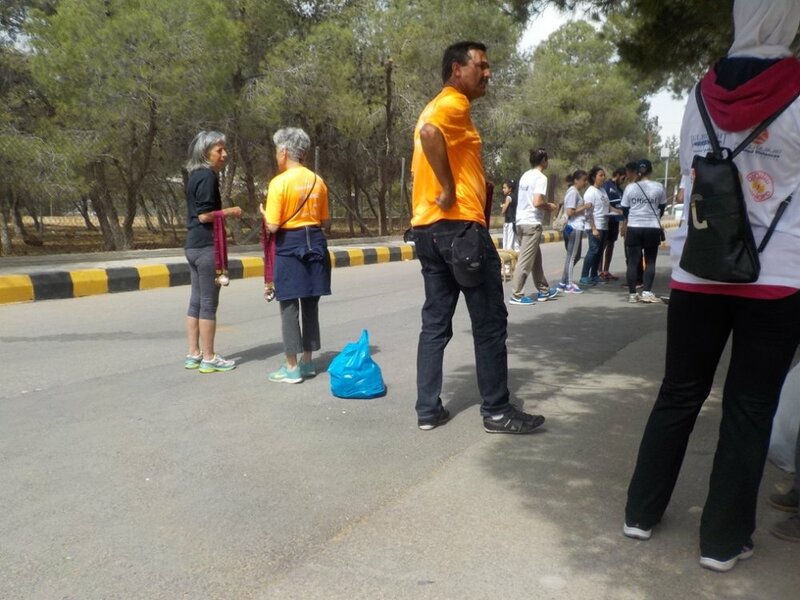 During the race, the volunteers along the course helped keep the girls on the correct path and provide encouragement. 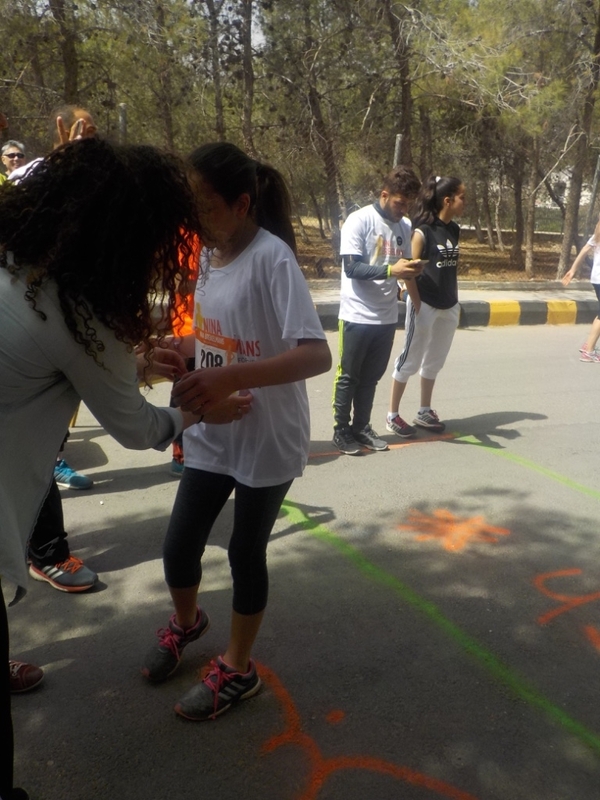 At the finish line, volunteers worked meticulously to track each girl’s time by quickly pulling off their bib tags and keeping them in their finishing order. 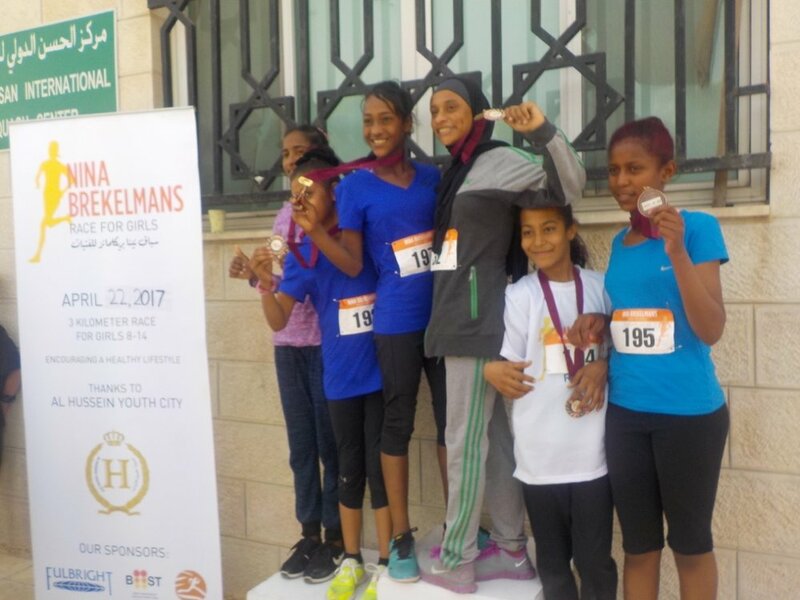 Then, the Brekelmans, including some of their extended family, placed a medal around each girl’s neck and congratulated them on completing the race. 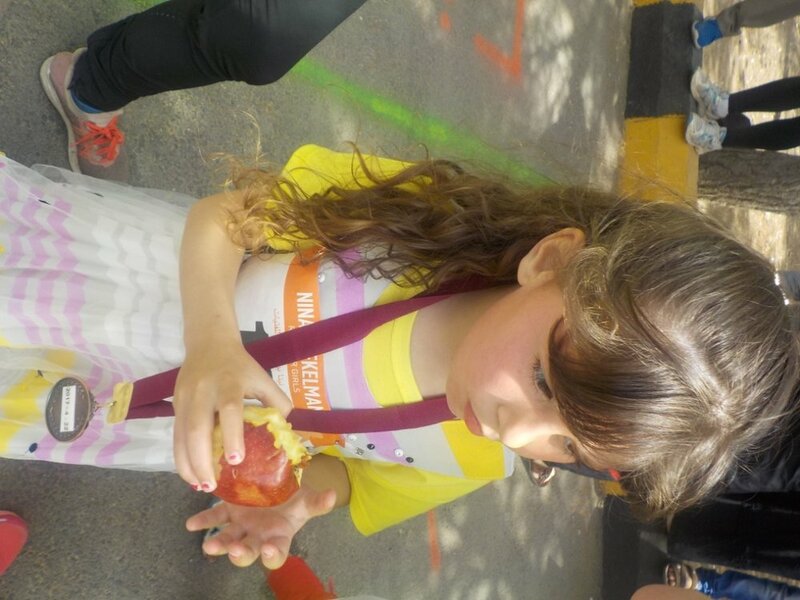 Afterward, the girls trotted off to cool down with water and apples. 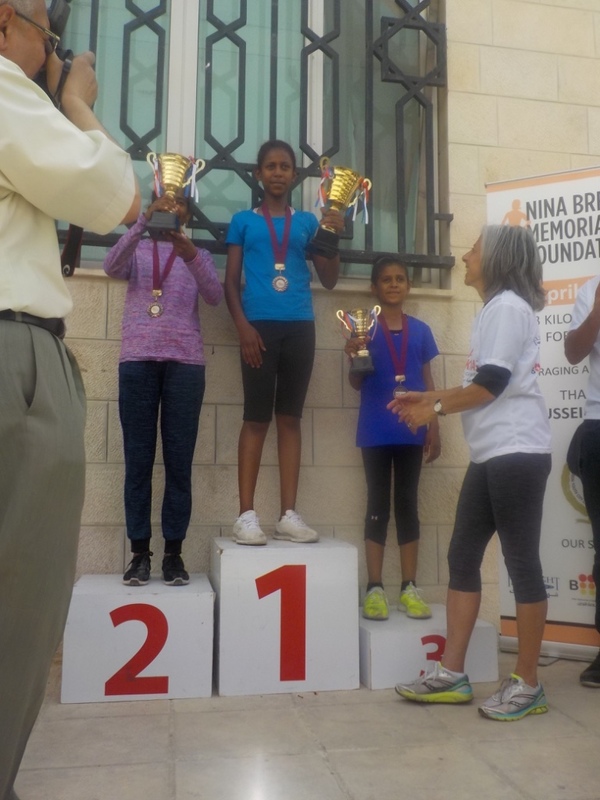 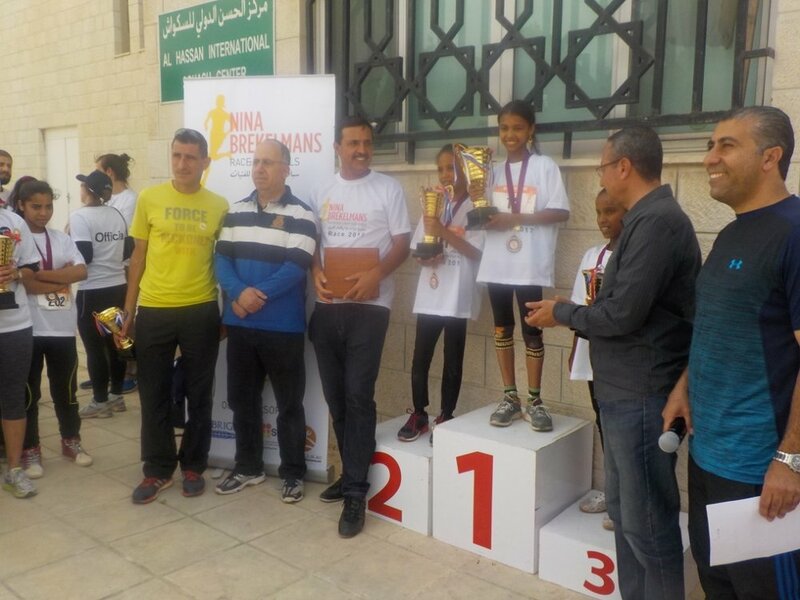 After the speeches, camp and race co-organizer, Matthew Liston, along with Coaches Sweity and Ibrahim distributed trophies to the top three girls in each age group (8–10 and 11–14 years old). 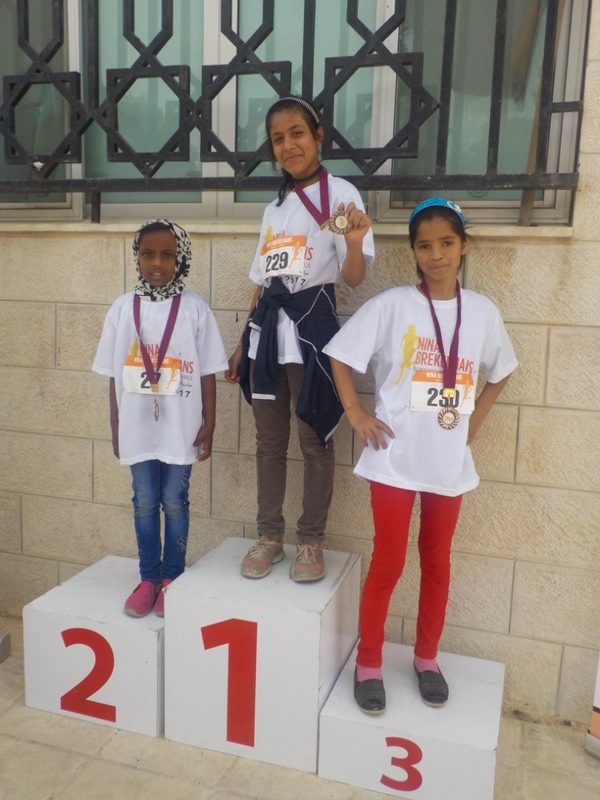 The girls posed proudly, with trophies in hand, for pictures on top of the numbered podiums as the ceremony wrapped up—after which, many of the other girls ascended the podiums for their own personal photos! 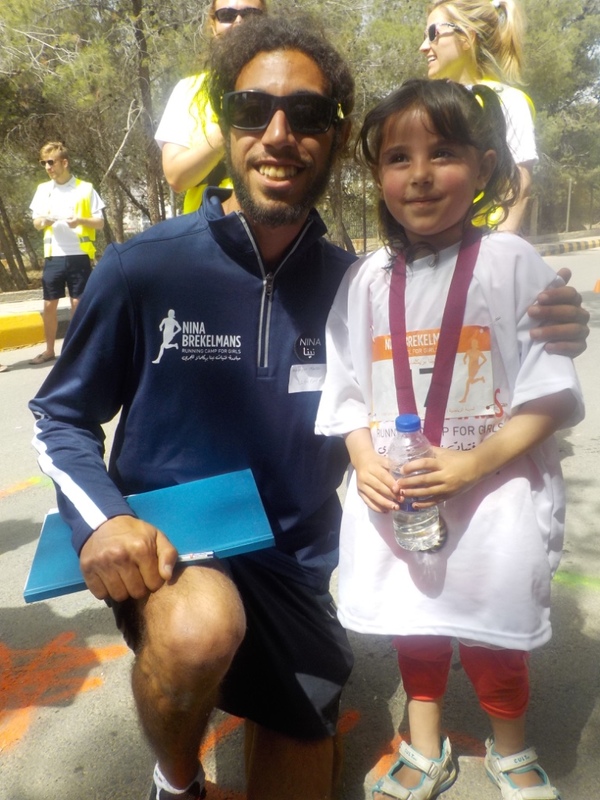 The race festivities concluded with an intimate welcome reception thrown by Captain Waleed, on behalf of the Squash Federation, for the Brekelmans family. 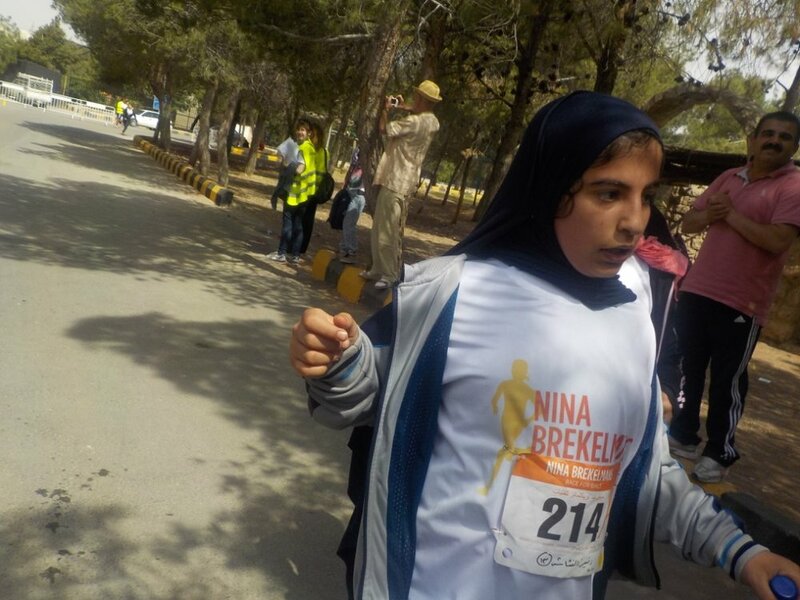 Over coffee, tea, and cookies, the Brekelmans, Sports City officials, and event organizers discussed the day’s events, running, and Nina’s legacy. 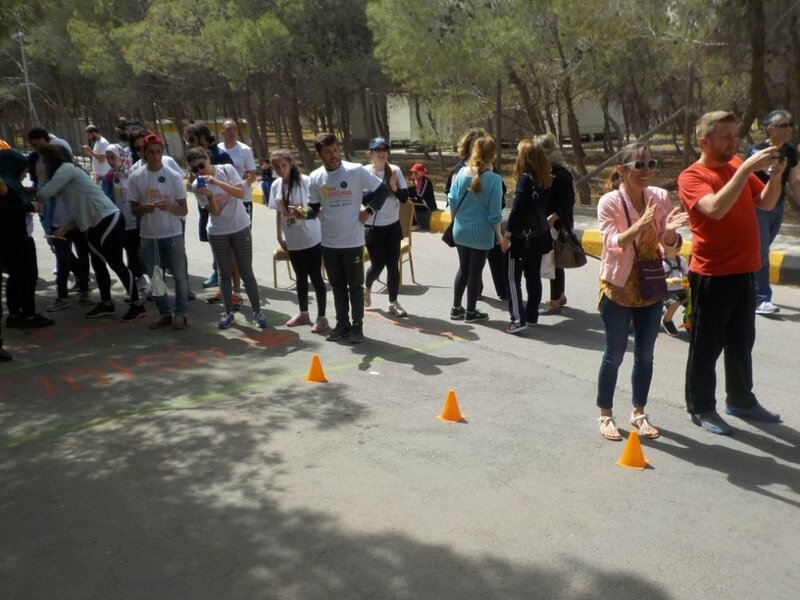 Overall, both the camp and race ended on a successful, upbeat note, highlighting this year’s achievements as well as next year’s ambitions.